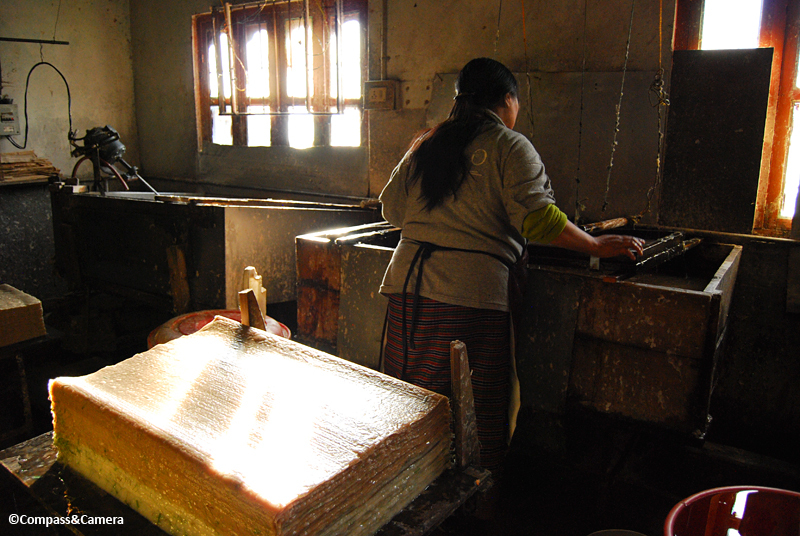 The Jungshi Handmade Paper Factory sits on a hill overlooking the mountainous terrain of Thimphu, Bhutan. 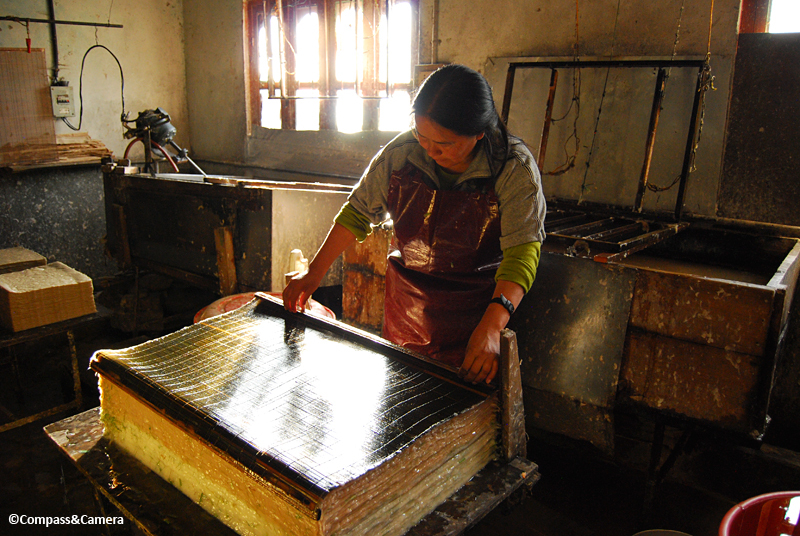 The paper factory illustrates the government’s resolve to support the local economy by preserving the country’s traditional arts, including paper making. 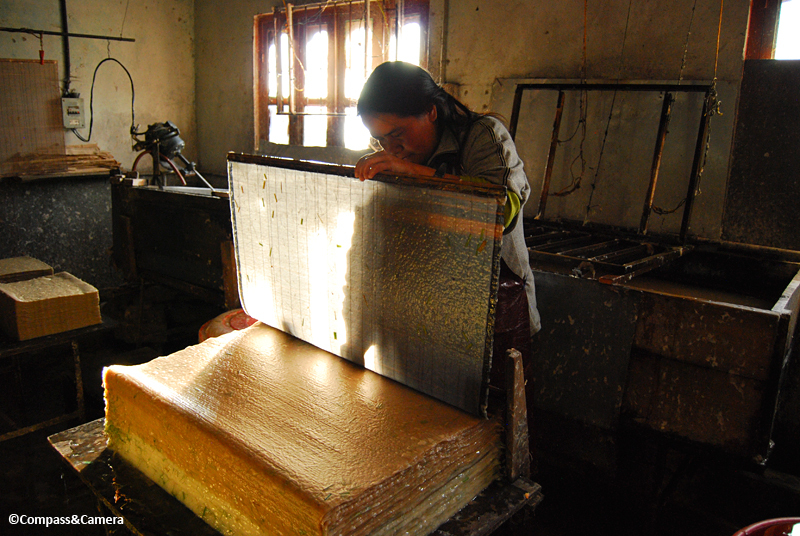 Jungshi means “natural” and the entire paper making operation is true to that name. 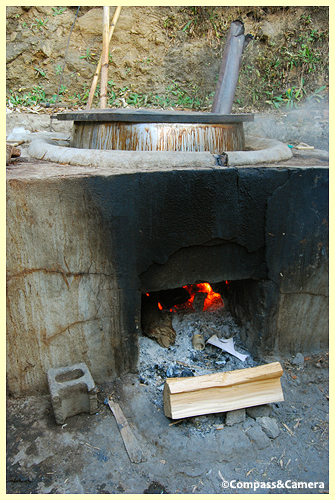 Bark from several species of Daphne and Edgeworthia shrubs goes through a process of transformation from bark to pulp to paper, known as deh-sho. 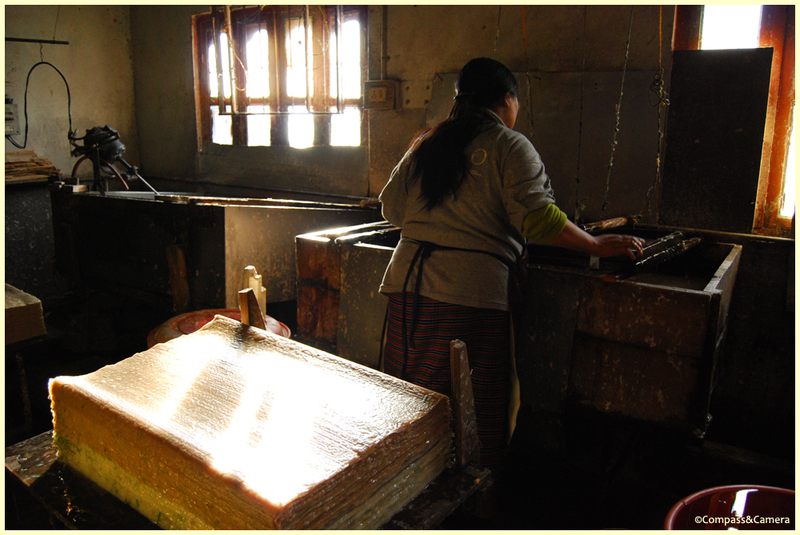 Bhutan’s Forestry Department uses sustainable practices to farm the shrubs and supply the bark to several paper making operations around the country, including Jungshi. 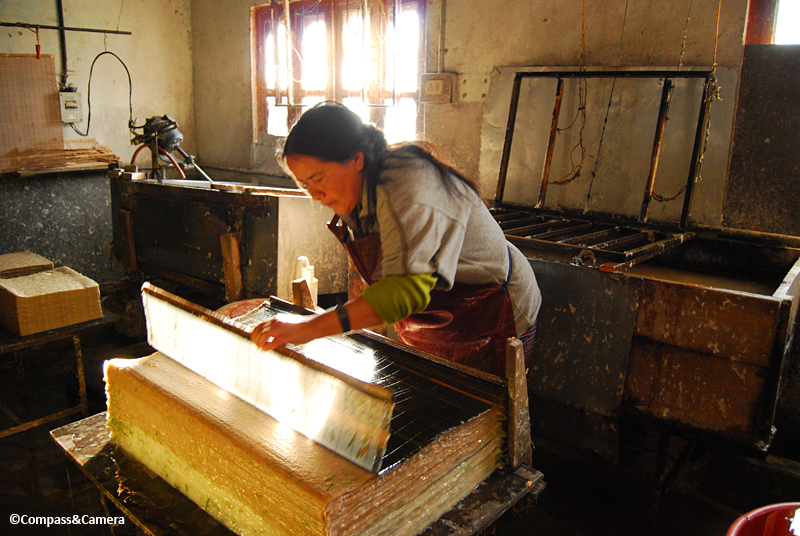 Jungshi produces about 1,500 sheets of paper per day. 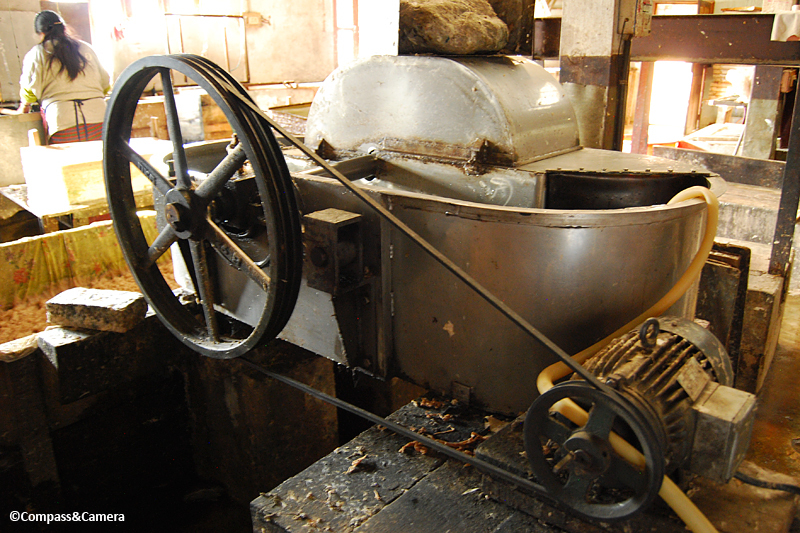 Bark from the shrubs is soaked in water to break down its structure, then strained from the liquid and brought inside the factory. 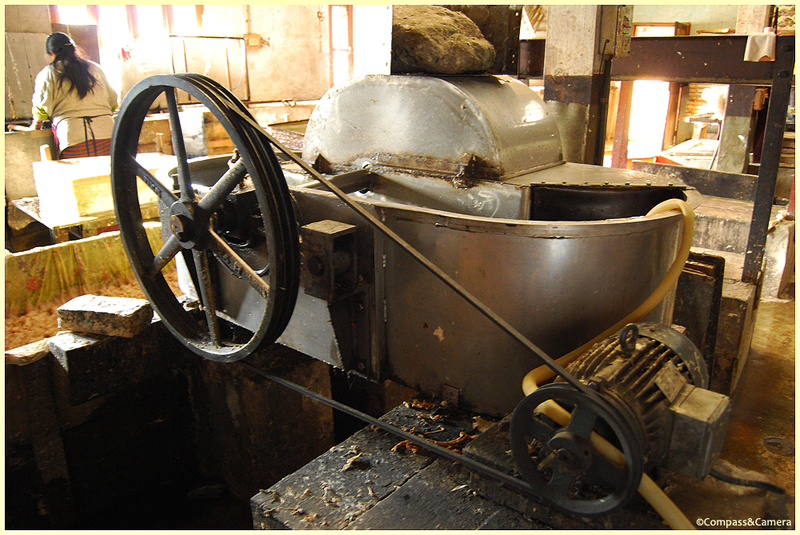 The stringy mass is fed into a grinder which spits out the pulp into a big vat, like a giant bowl of oatmeal. The next step is where the magic happens. 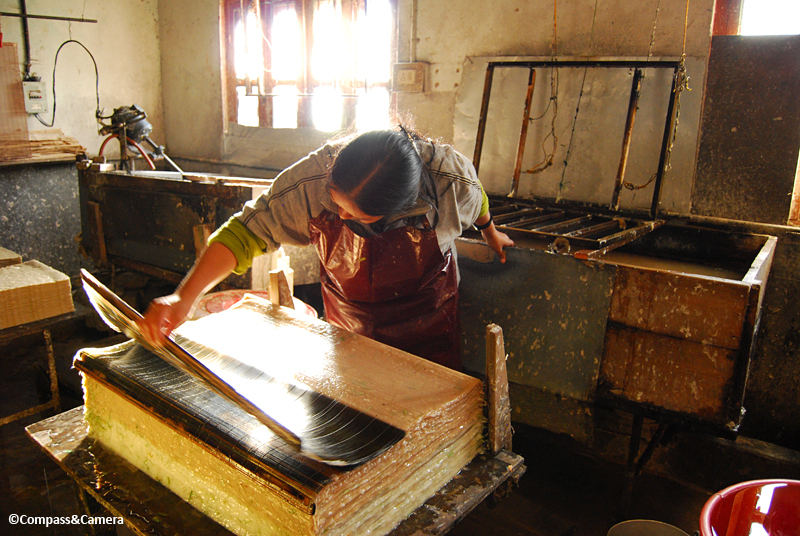 I was at the factory in the late afternoon when golden light was pouring in the windows as this woman worked with the paper screen. Watery pulp is spread evenly across the screen, then the screen is lifted out, aligned with the growing stack of wet paper, released on top of it and peeled off from the opposite edge, leaving behind the new sheet of paper. 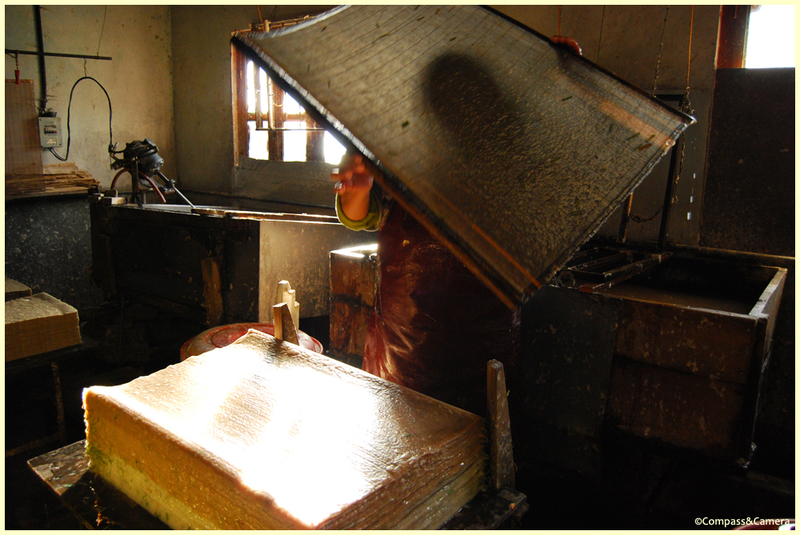 Stacks of paper sit throughout the factory — some of them wet, some of them dry, some of them sandwiched and pressed for flatness. 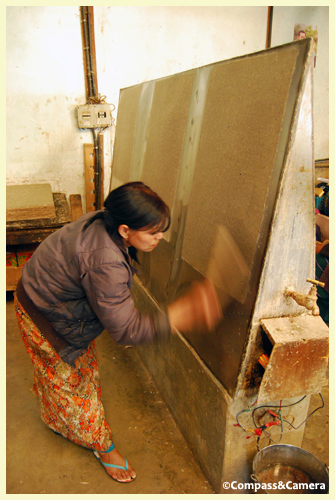 Sheet by sheet, dry paper is hung from an easel where it’s brushed off and inspected for quality. 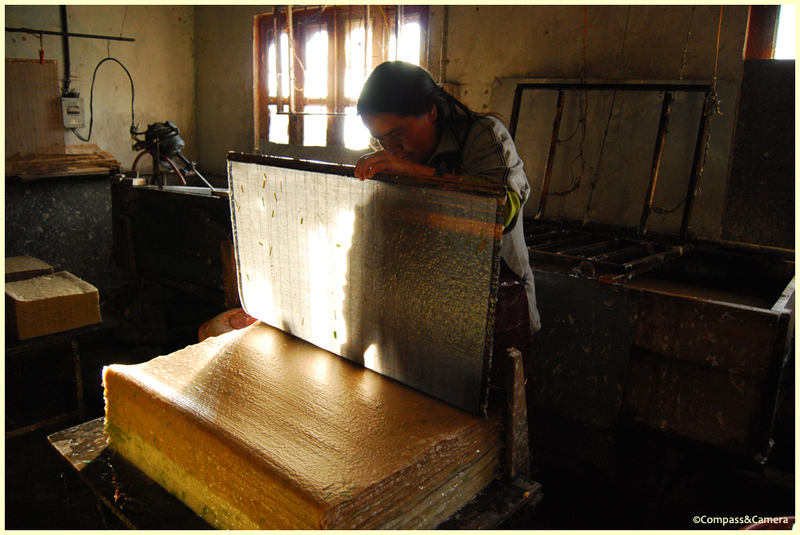 The finished paper is stamped with the Jungshi logo, then either shipped out from the factory or placed in the paper shop at the site. 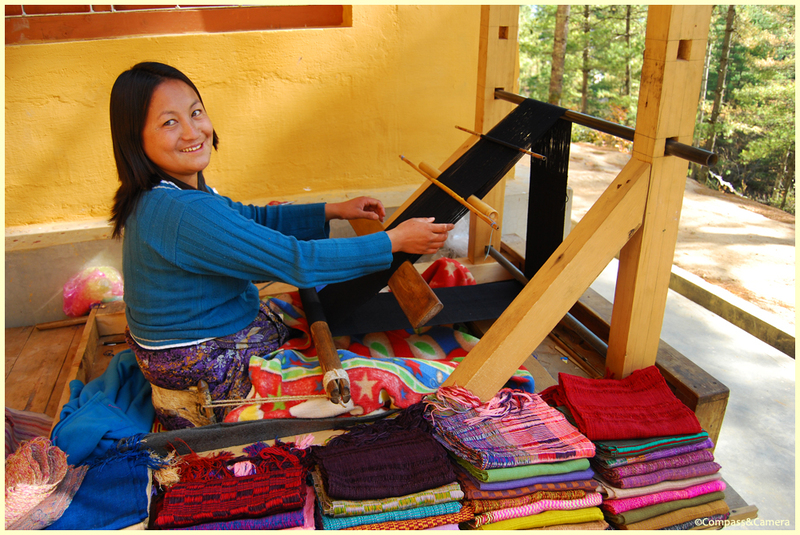 According to the U.N., demand for handmade paper from Bhutan comes mainly from Sweden and the U.K. Paper is used for greeting cards, gift wrap, stationery, books and certificates. 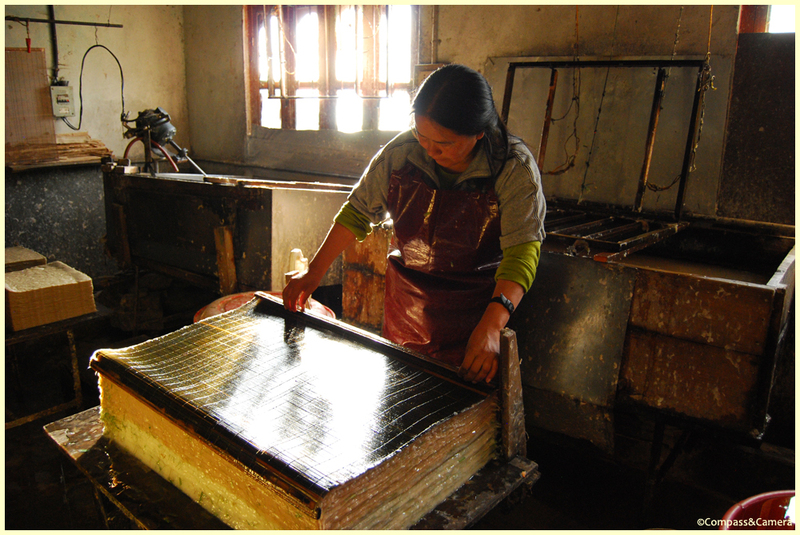 The Jungshi paper shop offers a nice collection of sheets and paper products, some of which contain additional leaves and flowers that grow wild around the landscape of Bhutan. Perhaps you recognize what’s been added here? 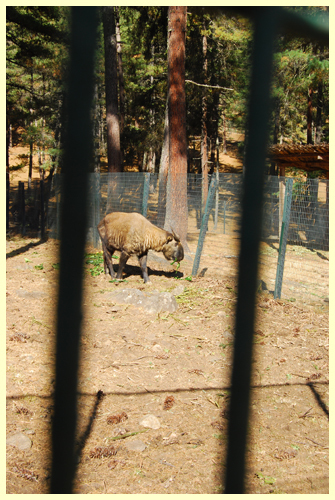 I love this week’s photo challenge: Frame. I’m sharing three of my favorite travel photos. We woke up early after a splendidly silent night in Wahiba Sands. The sun wasn’t quite above the horizon. 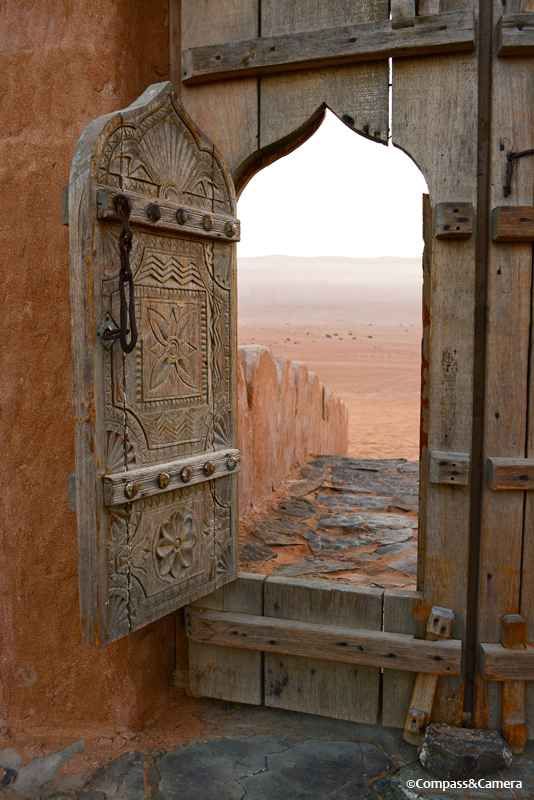 I opened the door within a door at the entrance to our desert camp and found two amazing views in the frame — a woodcarving that told its own story and a landscape that holds a thousand years of stories I’ll never know. This bridge had me at hello. 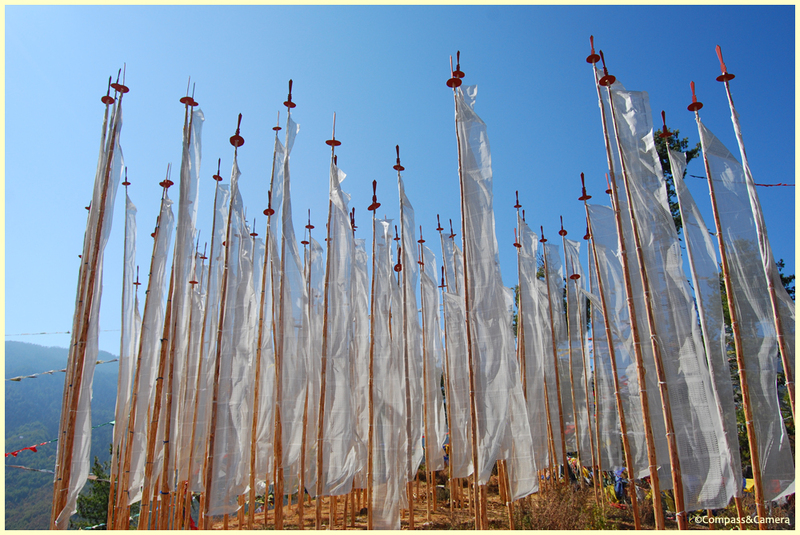 With hundreds of colorful prayer flags, all I wanted to do was watch and wait to see who walked through the wood frame at the other side. Sometimes when you’re traveling there’s a moment of beauty that catches you completely by surprise. This was one of them, at one of the thousands of temples in Bagan. 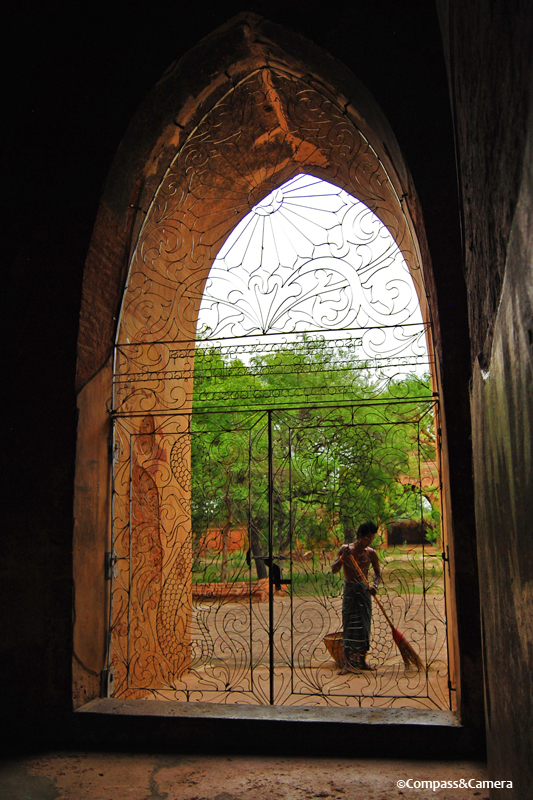 The tall doorway and ironwork framed this man perfectly, who was contentedly out for an afternoon sweep. 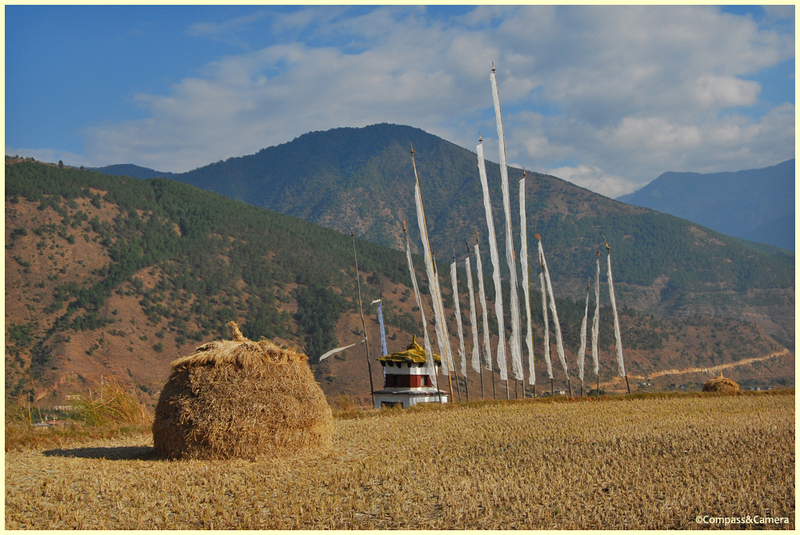 One year ago I was in Bhutan, traveling by road from Thimphu to the Punakha Valley. We stopped at the roadside to stretch our legs after the torturous, twisting dirt road finally relented at the valley’s edge. 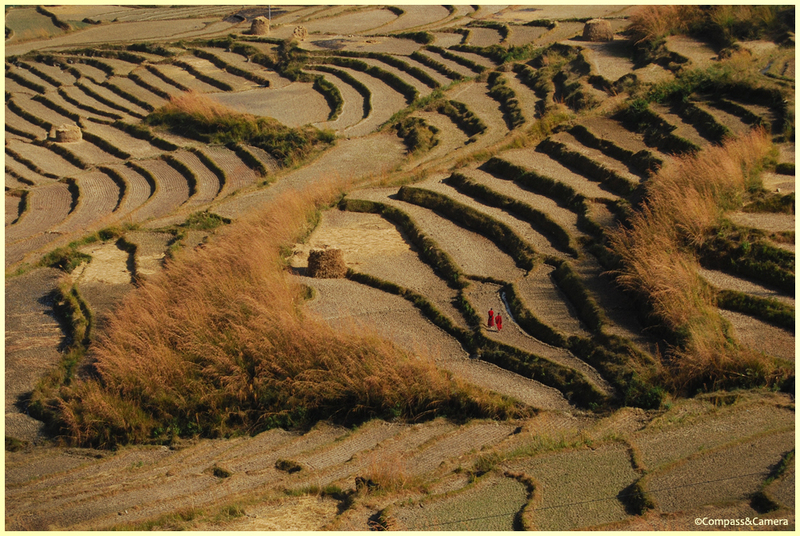 Layer upon layer of rice fields, in the weathered colors of autumn, defined the the valley like a topographic map. Two monks walked among them in the warm light of the afternoon sun. 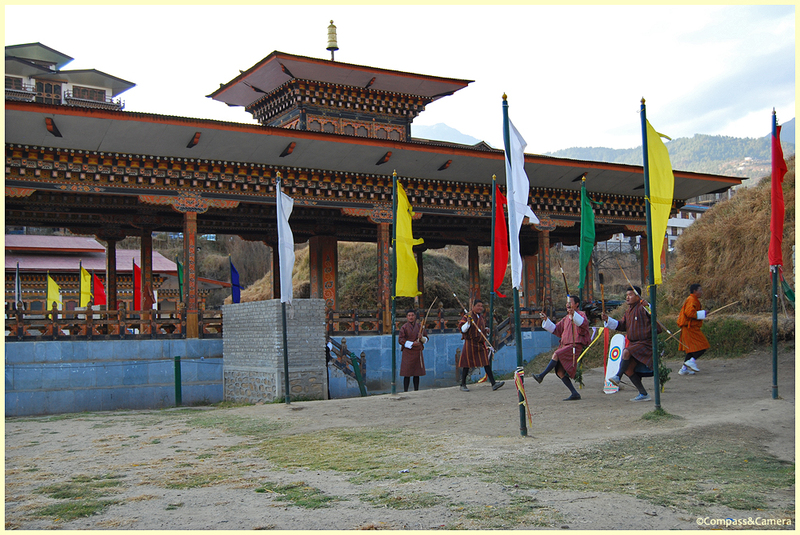 To read more about my travels in Bhutan, just click here. 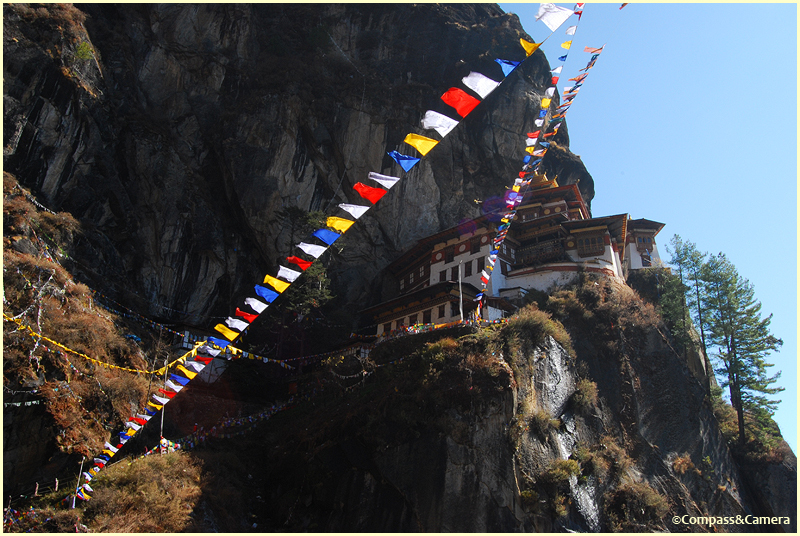 My final day in Bhutan featured a journey to the location most emblematic of this demure country — Taktshang Goemba, or Tiger’s Nest Monastery. 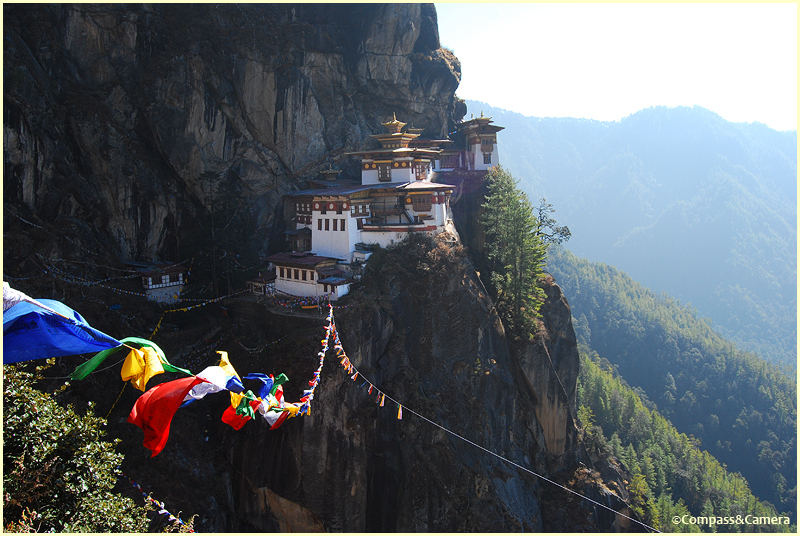 Mention Bhutan in conversation and Tiger’s Nest is the image that comes to mind for most people. Its anomalous, cliff-side location distinguishes it among the world’s many monasteries and religious sites. 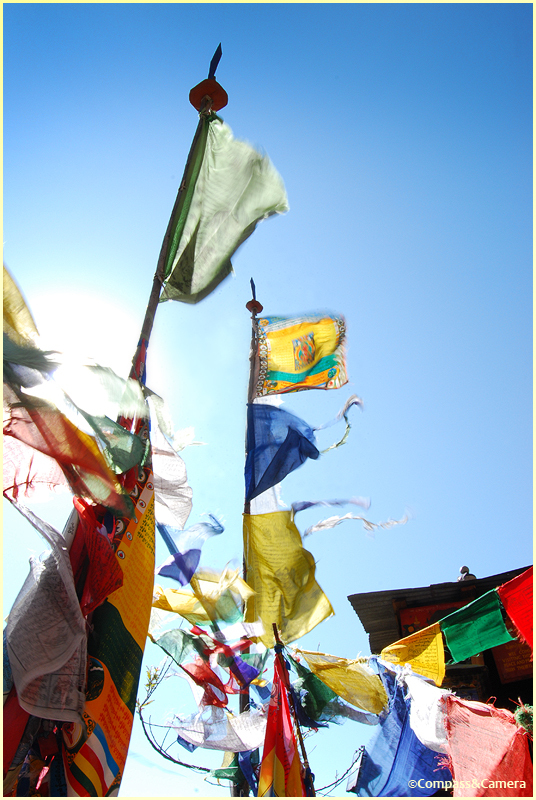 A trip to Bhutan would be incomplete without seeing it, for the pride of this small nation reaches its heights and waves proudly with its prayer flags. 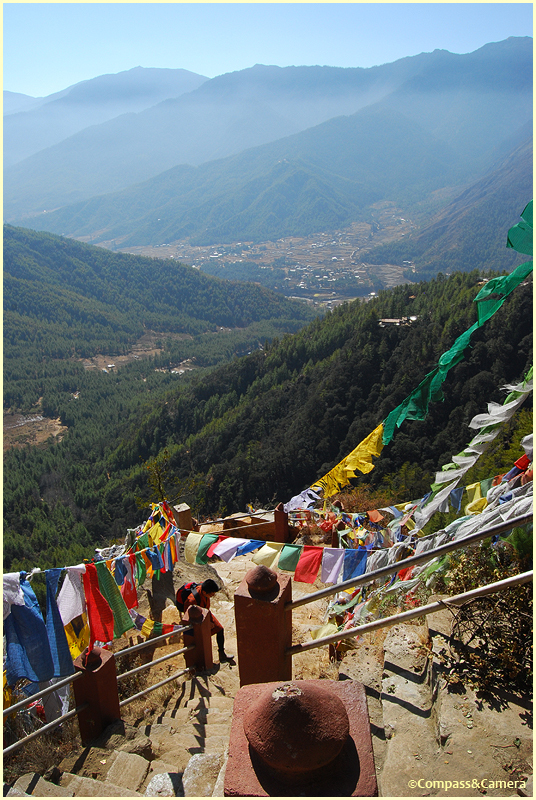 In the 8th century Guru Rinpoche, founder of Mahayana Buddhism, flew on the back of a tigress from Tibet to the cliff in Bhutan where Tiger’s Nest is located (hence the name). He slayed a demon and meditated in a cave for several months. 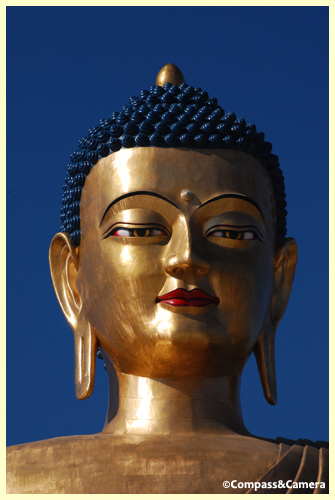 Guru Rinpoche transformed into eight manifestations, or gurus, each with a specific purpose. 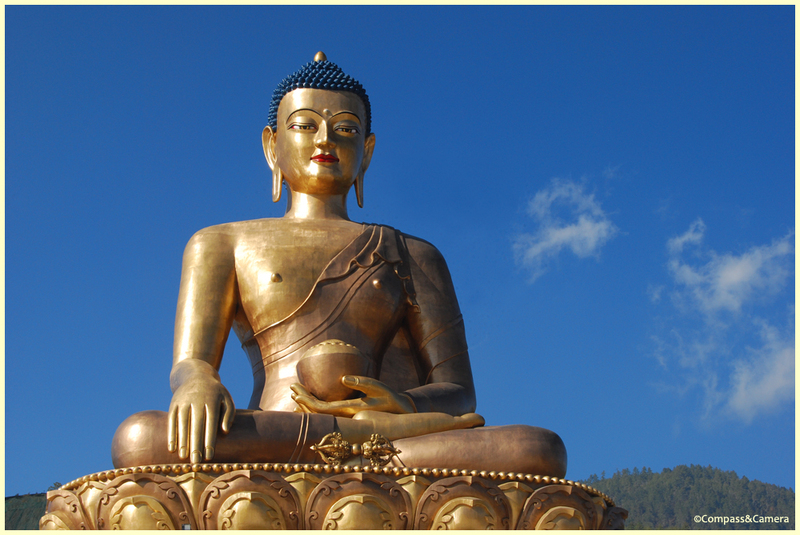 Regarded as the second Buddha, Guru Rinpoche remains an important figure in Buddhism in Bhutan. Many hundreds of years after Guru Rinpoche arrived in Bhutan, the 4th Druk Desi (civil administrator) Tenzin Rabgye became a key figure of the Drukpa (Bhutanese) state. 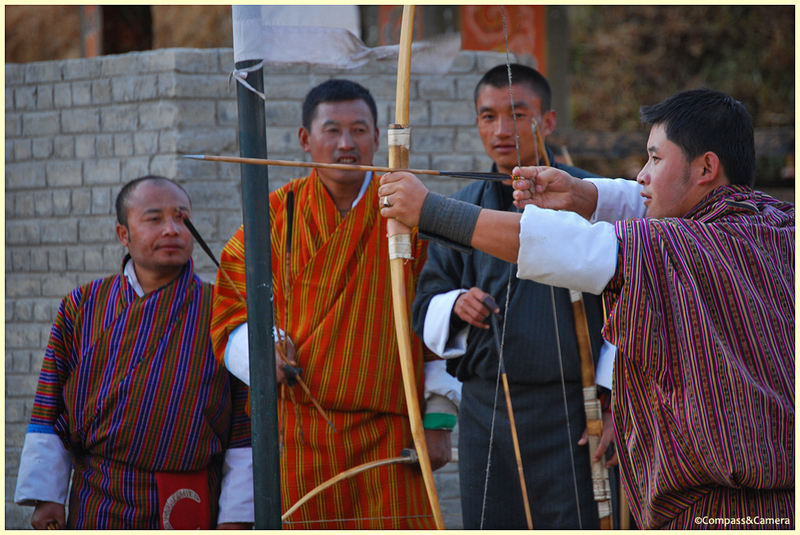 Also known as Gyalse or “Prince” Tenzin Rabgye, he introduced Bhutan to the festival dances of Tshechu and its massive wall hangings called Thongdrol. 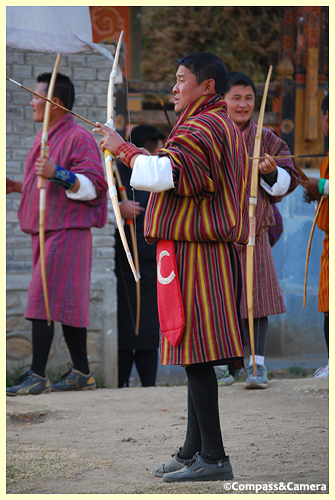 Both remain important facets of today’s Bhutanese culture. 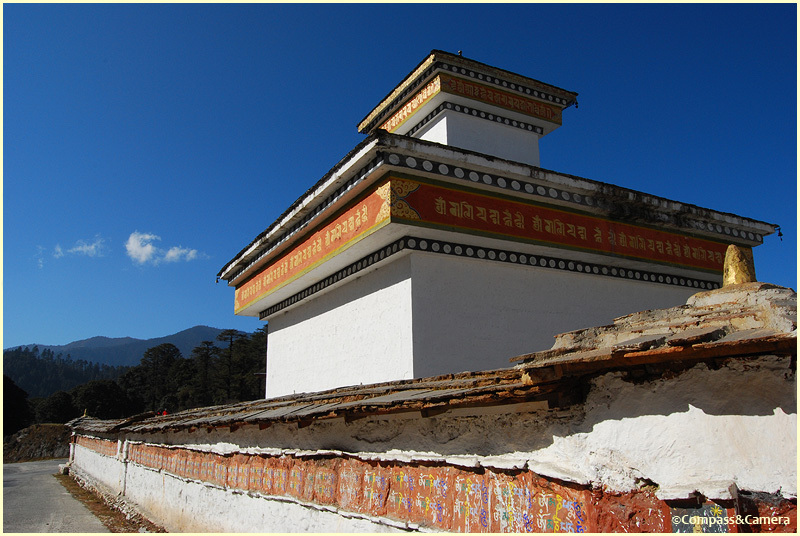 Upon visiting the cliff-side cave where Guru Rinpoche had meditated in the 8th century, Gyalse Tenzin Rabgye declared that a monastery should be built in his honor. Thus, the creation of Tiger’s Nest in 1692. 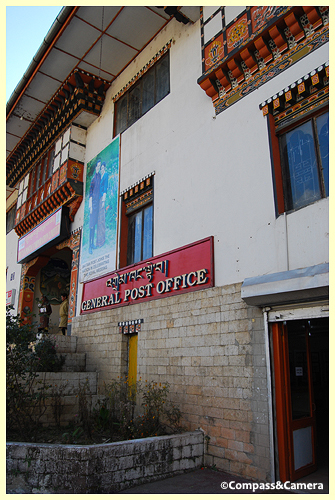 We left the hotel at 7:00 a.m. and made a short drive through Paro, into the hills, to the base of the mountain. Horses and guides waited to carry passengers to the top, but we went by foot. Tiger’s Nest was visible at the start — like a brush stroke of white on a gray granite cliff, to the right of a small couloir. The morning was pleasantly cool — perfect for hiking. 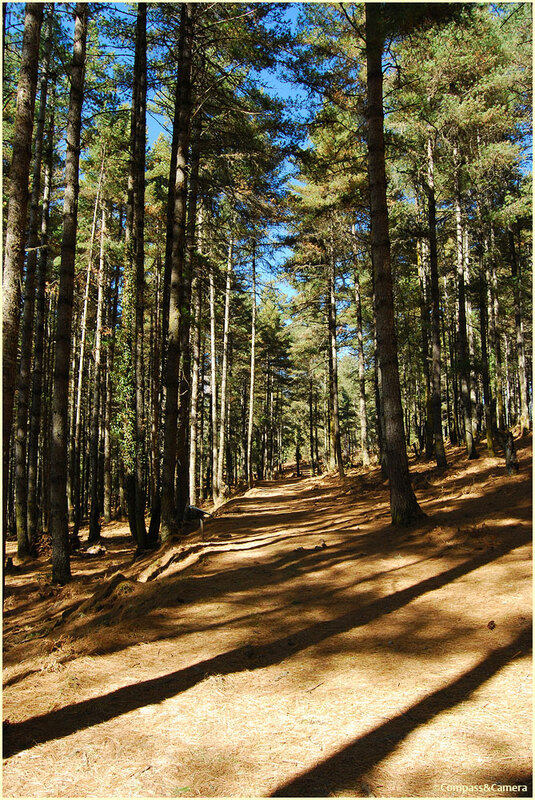 The terrain felt like home, with pine trees and brush and a well-worn trail that moved quickly from a flat introduction to a steep first act. Within ten minutes I was removing layers in a familiar habit from countless days spent hiking in California and Colorado. Now living in Singapore, it was SO good to be back on a real mountain trail. Switchbacks snaked left and right and gradually lifted us up the mountain where we paused for a photo and wondered if we were really getting any closer. We could see Tiger’s Nest again, this time high on the mountain in front of us as we passed a long line of prayer wheels on a flat stretch of dirt. About one hour into the journey, we reached the halfway point marked by a quaint cafe with an outdoor terrace and a good vantage point of Tiger’s Nest. With little traffic on the trail, we decided to keep going and stay ahead of other tourists making the same trip. 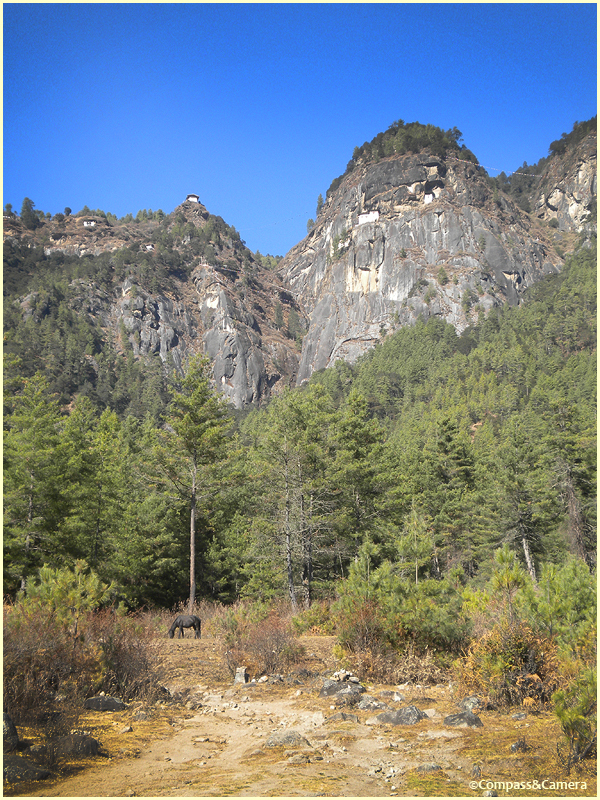 But let’s be honest — there aren’t many tourists in Bhutan, so feeling crowded on the trail wasn’t really a huge concern. The trail went up and up again for another 45 minutes, finally flattening out along the side of the mountain. We had reached the highest point, now hiking straight ahead until we reached the mountain edge where the trail emerged from the trees revealing an eye-level view of Tiger’s Nest. 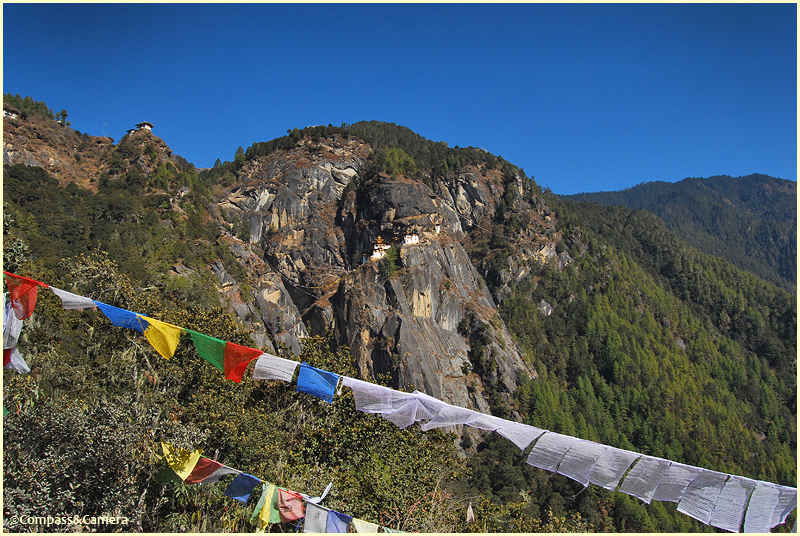 To the right and below, the trail dropped steeply and finished its delivery but the view of Paro, prayer flags and Tiger’s Nest across the gorge held me captive for several minutes. It was the view I had seen in so many photographs. Even standing in front of it with my own eyes I had to remind myself: I AM HERE. 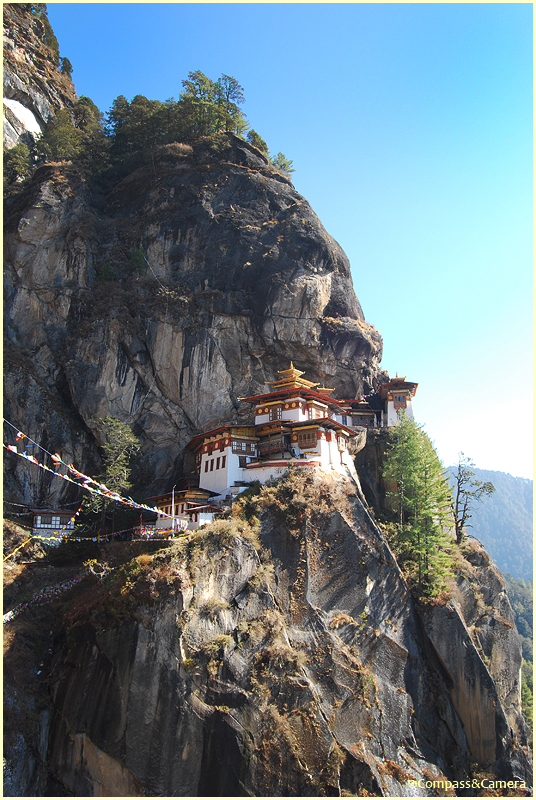 I AM AT TIGER’S NEST IN BHUTAN. Take it in. Look at the details. This is NOT a postcard. This is happening! And nothing is happening! It’s perfect — just sitting there for me to see, at this moment, in this life. We followed the stone steps, descending along the mountainside as the trail zigged and zagged. 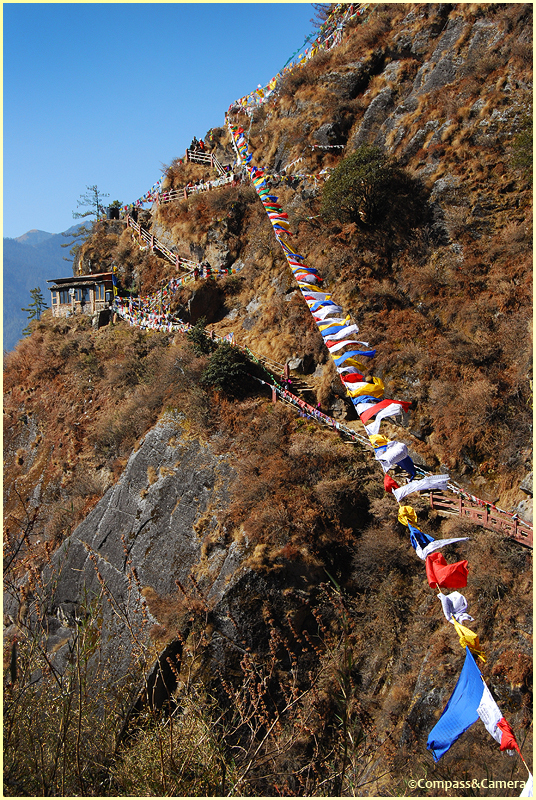 Tiger’s Nest loomed above us across the gorge as countless strings of prayer flags shifted in a colorful dance around us. We crossed the footbridge at the deepest point of the gorge where a white ribbon of water rushed down the granite face from above. We started climbing up again as I turned to look at the trail behind us. 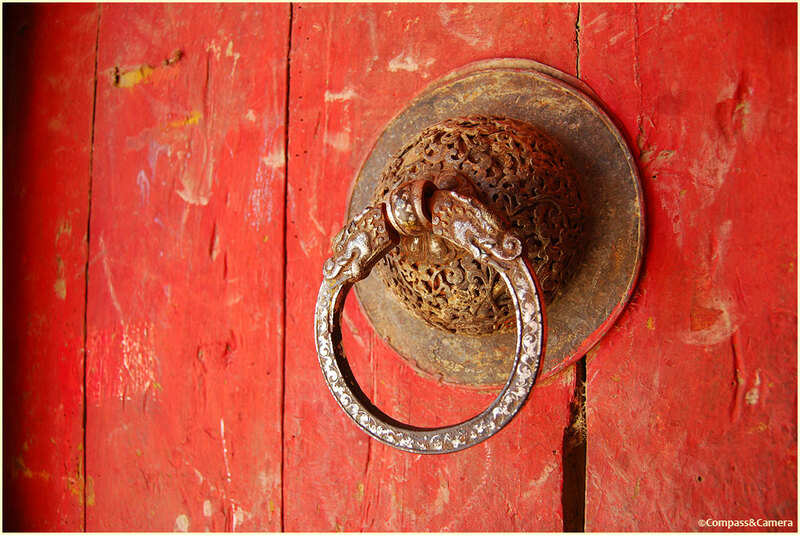 A final flight of stairs led through the entrance to Tiger’s Nest — double wood doors in a small stone wall with tin shed roofs. I was surprised that we would actually be able to enter the monastery, but that’s the rare beauty of a small country like this with the space and kindness to accommodate the curiosity of travelers like me. We arrived at the guard house where we were required to check our bags and cameras, leaving the interior journey to my description and your imagination. As you would assume based on the unusual shape and location of Tiger’s Nest, its inner chambers are stacked and wedged into the mountain with connecting steps and staircases. We removed our shoes and entered the first room — an intimate cave that fit just a few people, with a low ceiling and a small Buddha statue. Warm, quiet, insulated. 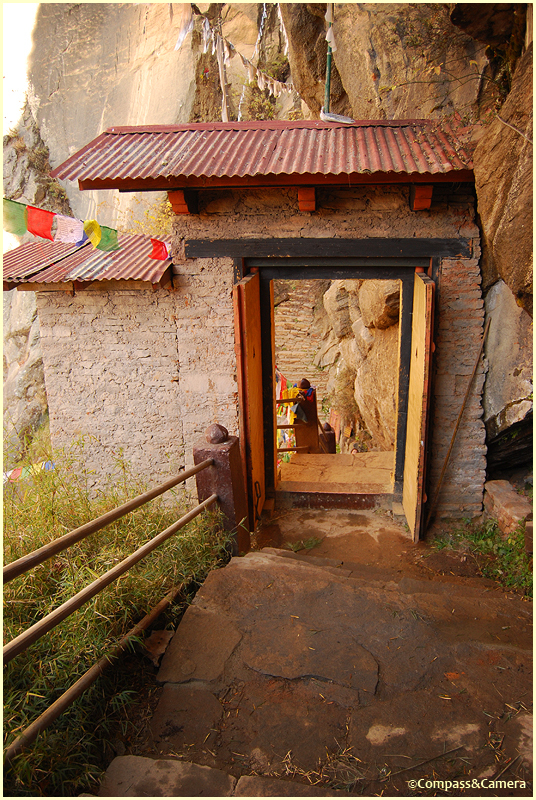 It is said that Guru Rinpoche meditated here for several months, and there is a gilded doorway (seldom opened) to another cave beyond. Back outside, we climbed a ladder-like staircase to the next level. The second chamber was comparatively large, with bigger statues, a high ceiling and a trap door that revealed a cave connecting to the first chamber below. Mysterious, cold, cryptic. 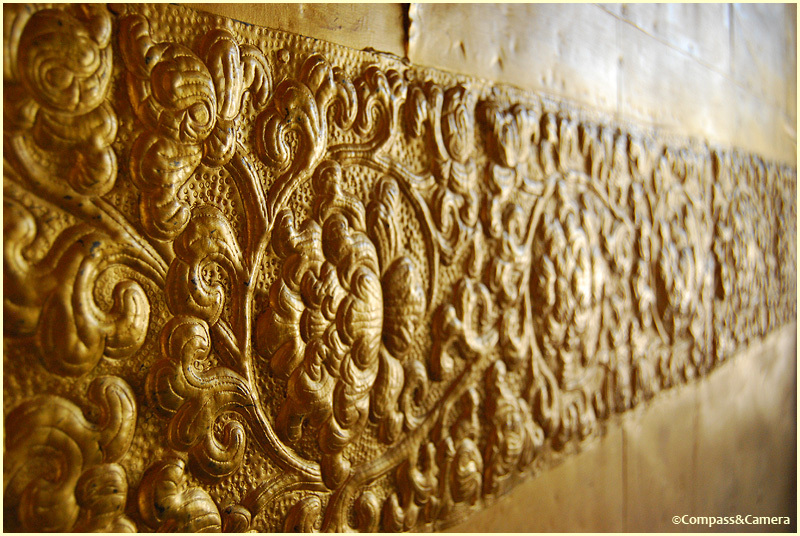 Each wall was painted and decorated with endless detail. The third chamber was mid-sized and we were the only people inside. Familiar, approachable, positive. Kinga explained to us that if we had come to Tiger’s Nest to get a name for a child this is where it would happen. “I want a name,” I said. “You want a name?” Kinga replied, looking at me curiously. “Yes, I’d like a name. 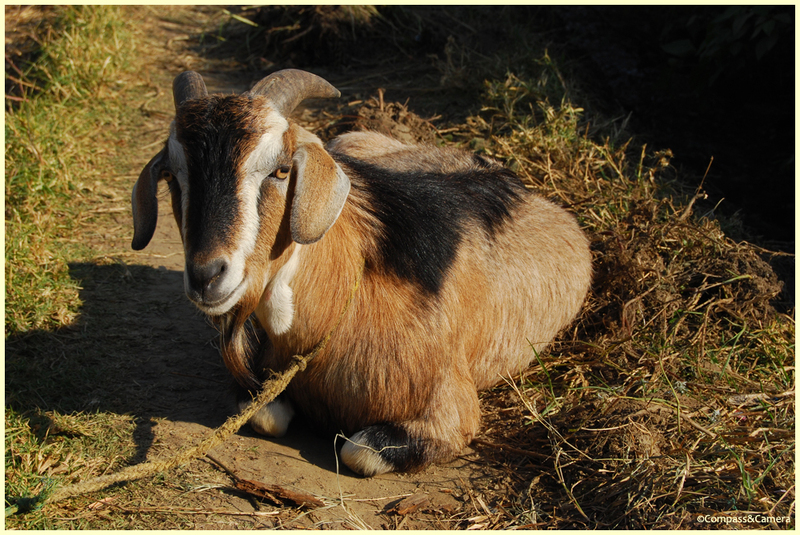 Can I have a name?” What a once-in-a-lifetime opportunity to partake in a Bhutanese tradition! Clearly there was no better place in the world. Surprised by my request, Kinga scurried out the door to find the monk who would possibly fulfill my request. 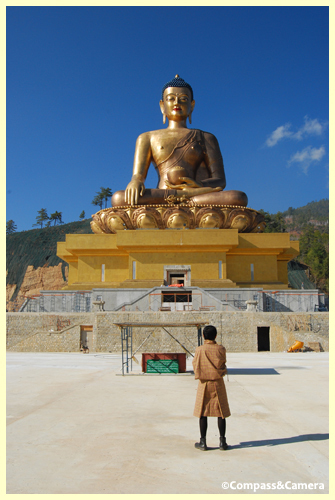 Upon their return there was a brief bit of Bhutanese negotiation, then Kinga told me to make a wish — boy or girl. The monk reached for a small glass jar filled with dozens of rolled strips of paper. He removed the top and offered the open jar to me, from which I picked a piece of paper. He unrolled it and wrote it down. I now had a name — two names actually, as is the Bhutanese custom. My name (which I will keep to myself) loosely translates to “Perfect Happiness” and yes, I was perfectly happy. 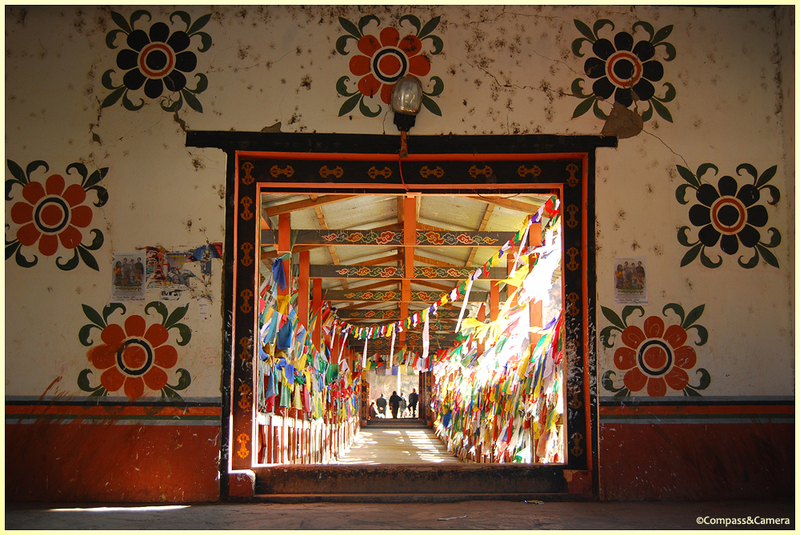 Our final destination was another mid-size chamber packed with statues, paintings, figurines, butter lamps, offerings and explosive color throughout. Grand, overwhelming, divine. A massive Buddha statue dominated the room, filled with natural light from a window on the south side. Again, I was astonished at merely being inside the monastery but viewing each chamber had been a personal experience that provoked a wide range of thoughts and feelings. 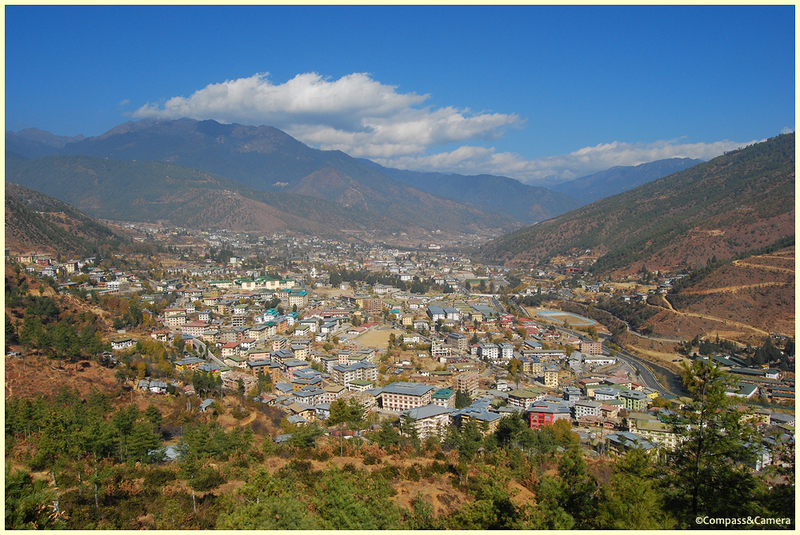 We stepped outside, put on our shoes and lingered at an overlook that faced the Paro Valley several thousand feet below… just the warm sun, cyan sky and pleasant breeze accompanied us in reverence. We departed the monastery and meandered down the steps, across the gorge and back up the other side. I think I shot a hundred photos — zoomed in, zoomed out, horizontal, vertical, snap, snap, snap, you may never be here again. The remaining trip to the bottom was far less arduous, filled new memories of a very special place. We stopped for a quick lunch at the cafe (good food) and then continued down the hill. Back at the car we departed for the remaining two sites of our trip. 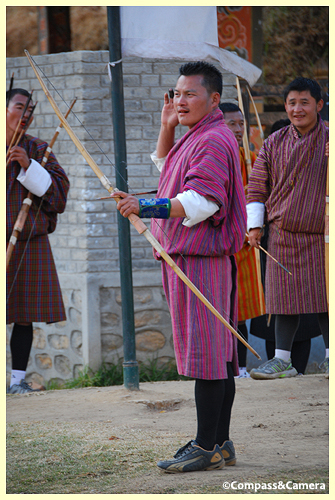 We traveled a road leading up a hillside, past an archery competition, to another area of Paro. The National Museum overlooked the valley from a fantastic perch on the hill. Damaged by an earthquake, the National Museum looks like it might collapse at any moment with large visible cracks and a portion of its wall reconstructed with unpainted stone. It has a circular shape like a conch shell with a wall several feet thick. The artifacts of the museum have been transferred to a more secure building across the driveway. The exhibits include an incredible room of Bhutanese masks, as well as tapestries, tools, weapons and clothing from the past several centuries. 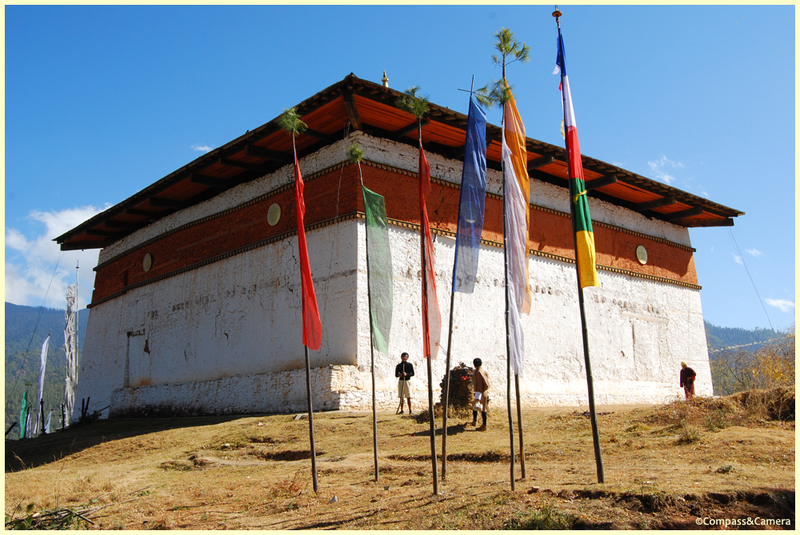 Our final stop was a very old stupa in the Paro Valley — Kichu Lhakhang, built in the 7th century. It was modest and soft spoken, with a homier feel than its grander counterpart up the mountain. A couple of sleepy cats guarded the inner courtyard where a beautiful door led to the prayer hall. Its dark, worn interior breathed heavily with age and wisdom. 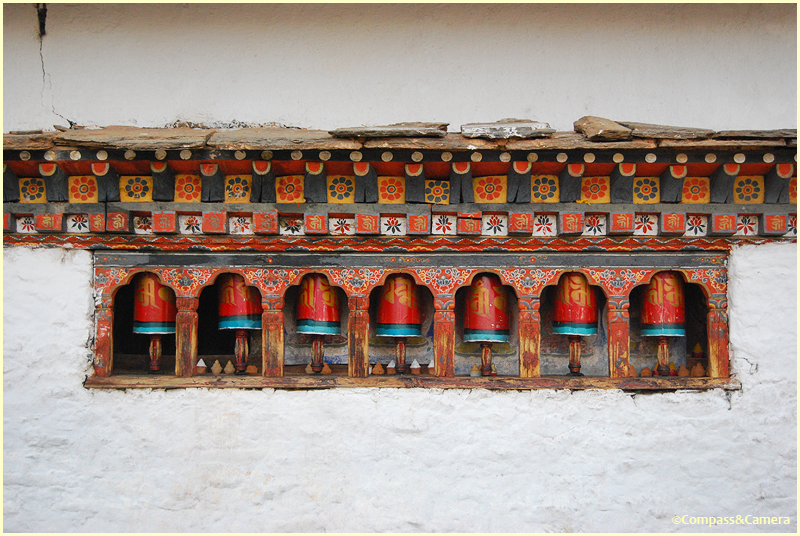 The exterior was perforated by a long line of prayer wheels and two kids kicked a ball as butter lamps flickered inside a small shed. It was a perfect scene to end the trip — life, peace, devotion and beauty in a country overflowing with the same. Do your research (thanks KB! 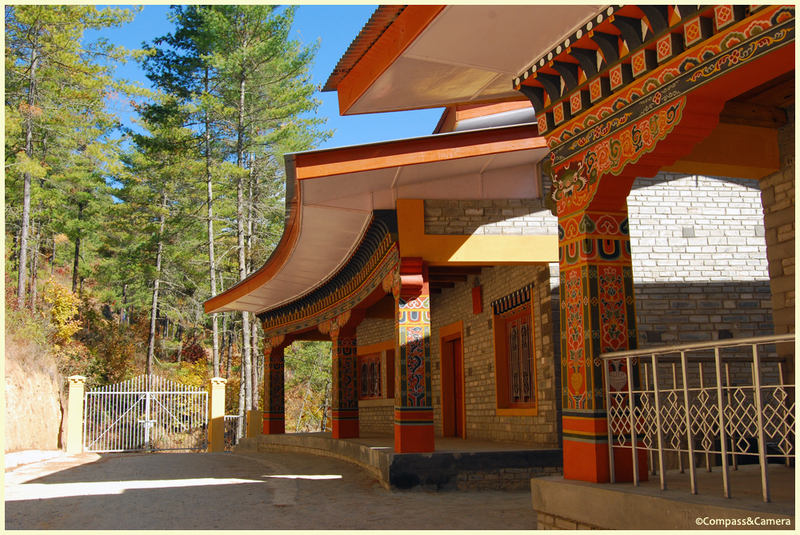 ), understand what you’re paying for and consider booking with a local Bhutanese company like Bridge To Bhutan. (They are wonderful, by the way. Hi Fin! Hi Lotay!) 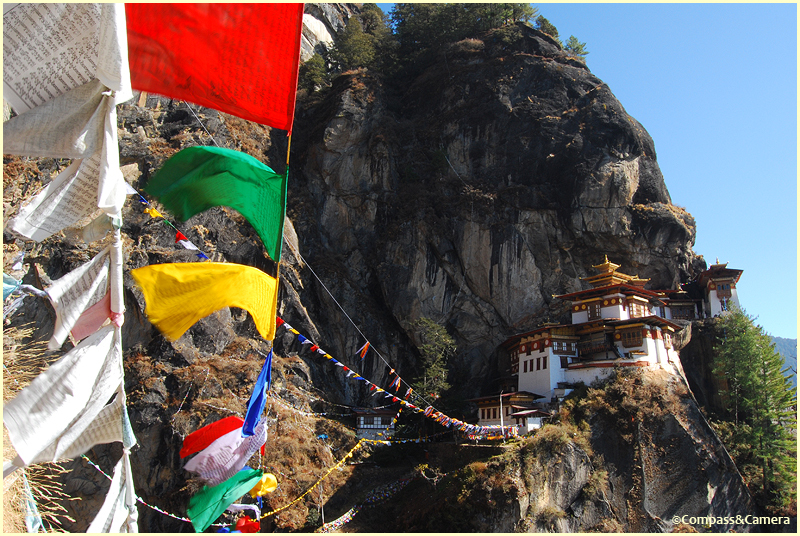 Bhutan levies a tourism fee of $250 USD per person, per day. If you’re a single traveler, you will pay an additional $40 USD per day. (These totals may fluctuate slightly depending on what time of year you visit.) The government uses a portion of this fee to provide free health care and education for the Bhutanese people so your money is going to a great cause. The remainder of this fee goes to the local tour company who pays for your guide, your driver, your hotel room and your food (minus drinks and alcohol, airfare not included). So, all in on the ground for less than $300 per day? A pretty good deal. Compare that total with some non-Bhutanese tour companies around the world who are charging between $4,000 and $7,000 USD for a single traveler on a week-long itinerary (airfare not included), which is $500 – $1,000 per day. This is a massive difference in price. Perhaps these companies would claim their guides, accommodations and/or services are premiere or luxury, but for me Bhutan wasn’t a destination I needed to experience at a luxury level. Nonetheless, the “standard” places we stayed at were great — clean, modern, even charming (Meri Puensum Resort), and our guide and driver were smart, well spoken, friendly and fun to get to know. 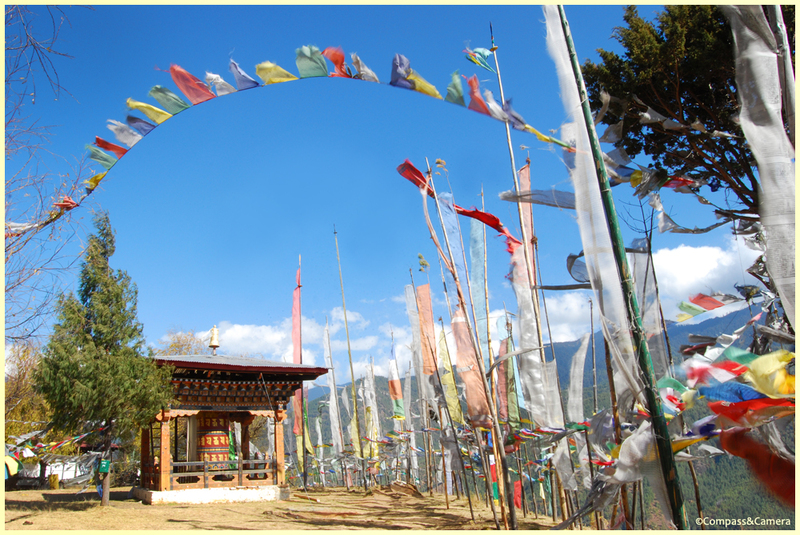 Bhutan is notorious as an expensive, out-of-reach, exorbitant destination… and wrongfully so, in my opinion. Choose wisely, do the revised math and put Bhutan back on your list. I think I hear the sound of one hand clapping. 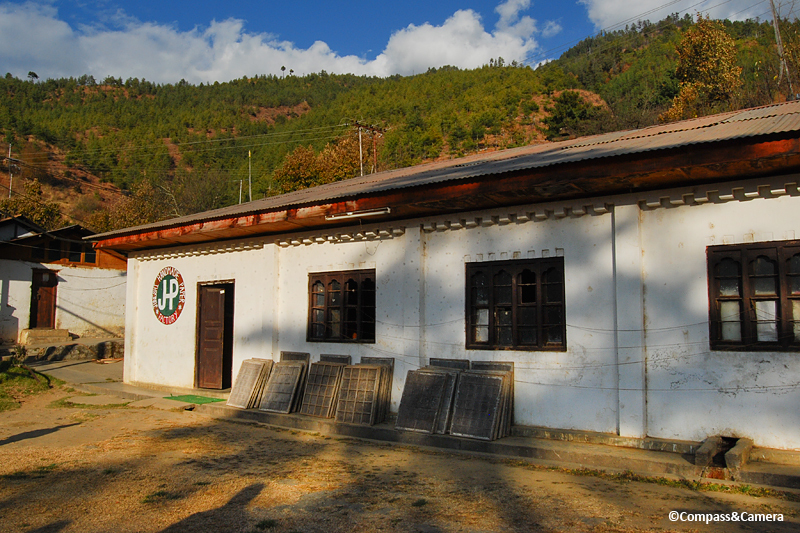 We left Punakha’s Meri Puensam Resort just after 9:00 a.m., according to the old fashioned clock hanging outside the reception cottage. 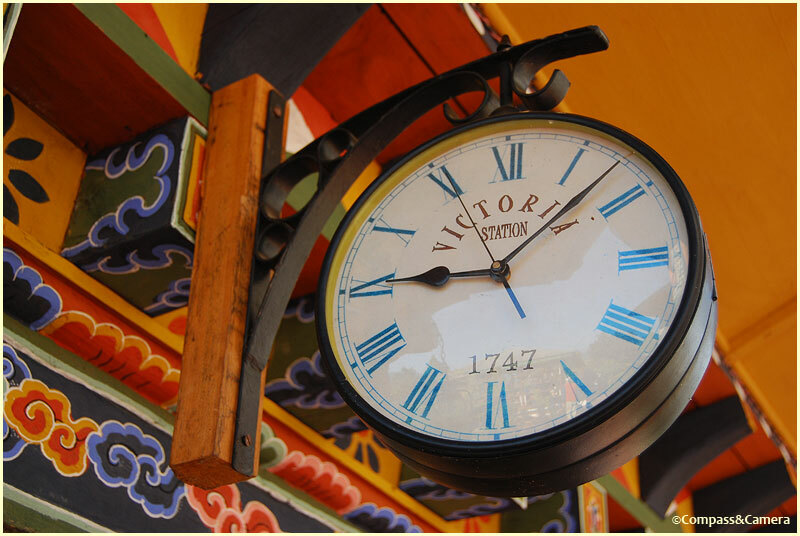 Like a lot of things in Bhutan, the clock looked old but new, machine made but hand-lettered, a blend of old style and modern convenience. 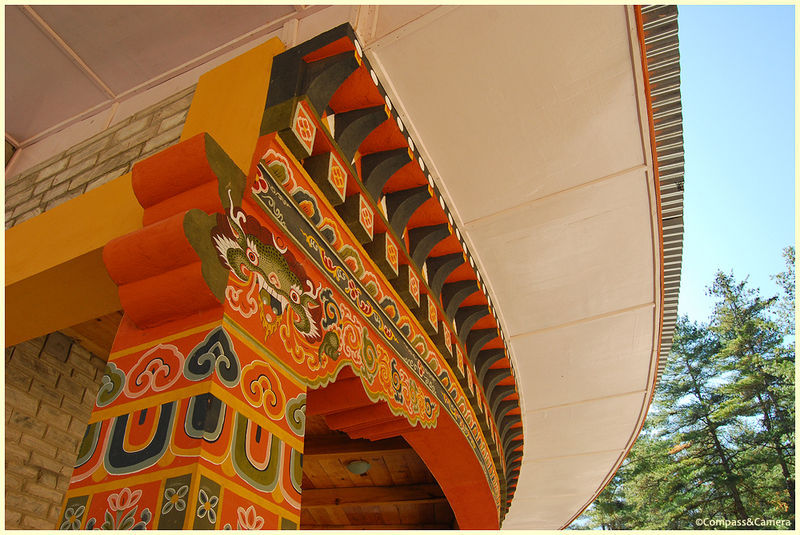 It seems like every detail in Bhutan has a story to tell, a bit of history to share or just something of interest that makes you wonder about its origins. 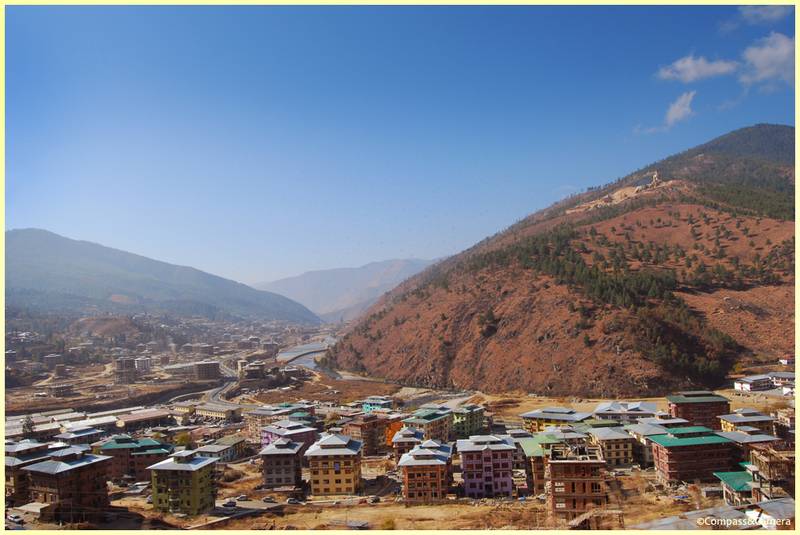 We drove north from the hotel, stopping at a small park with a view of Punakha Dzong — the focus of our morning. 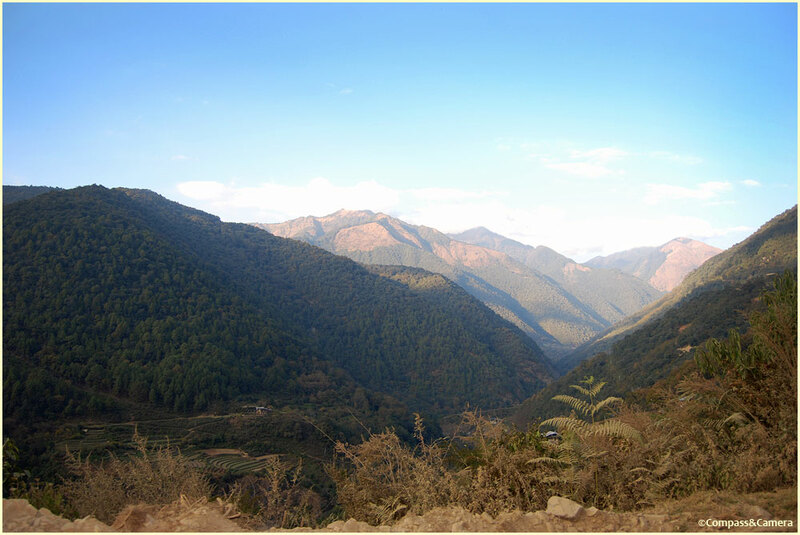 The sun had just come up over the mountains to the east, illuminating the isthmus at the confluence of the wide Mo Chhu and Pho Chhu (mother and father rivers). 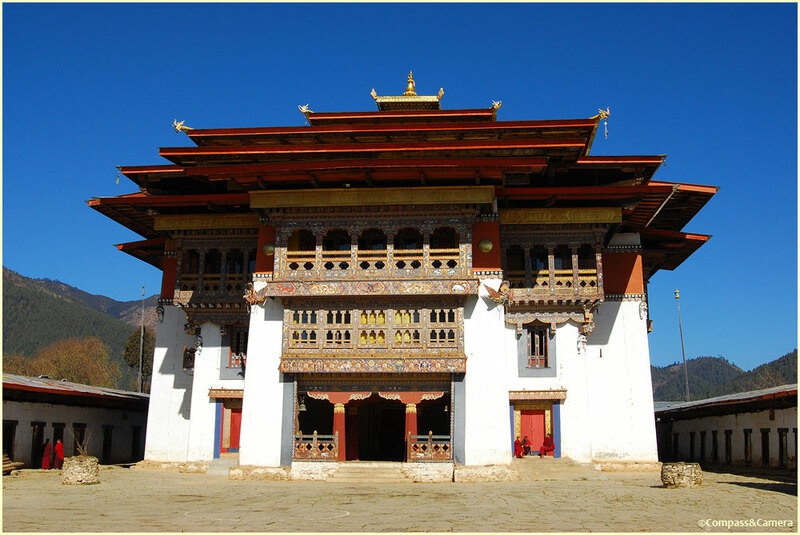 Punakha Dzong was built here at the base of the hill in 1637 — at the tip of the trunk of a sleeping elephant as metaphorically predicted by Guru Rinpoche, the founder of Mahayana Buddhism. Nearly 400 years of history, including fires, earthquakes and flooding, sat quietly on the riverbank in front of us. 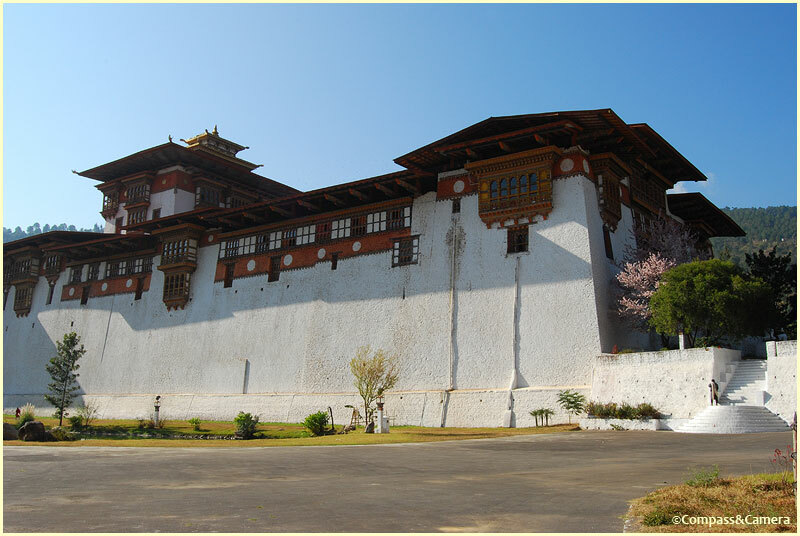 Punakha Dzong looked statuesque, fortified and regal, reached by a diminutive bridge over the river at the west side. 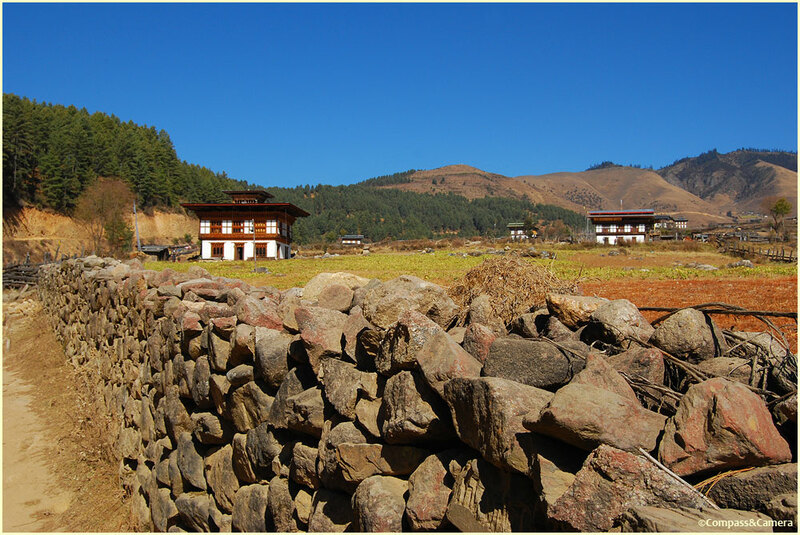 In looking at this photograph now, it’s apparent how perfectly proportioned Punakha Dzong is to its surroundings. It is beautiful but not ostentatious. Its height complements the width of the rivers. The contour of the structure matches the contour of the mountain behind. How fascinating to wonder about the process of designing and building it so many years ago. Did the builders stand at this exact viewpoint, pushing the height and roof tops up, up, up until they seemed in perfect harmony with the landscape? Upon crossing the bridge, I discovered the bridge is not diminutive at all and actually rather large with post and beam construction and a gable roof. 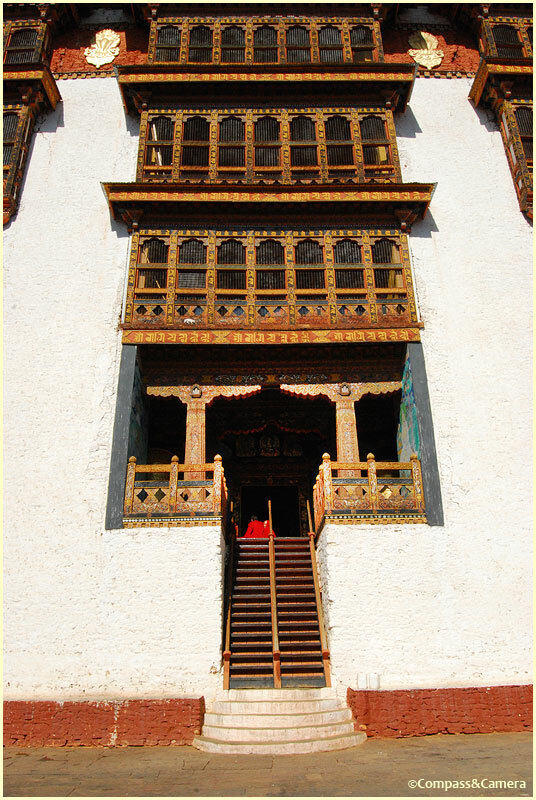 Over the river and through the doorway, the gargantuan scale of the dzong became suddenly apparent as I stood in its shadow and looked up. 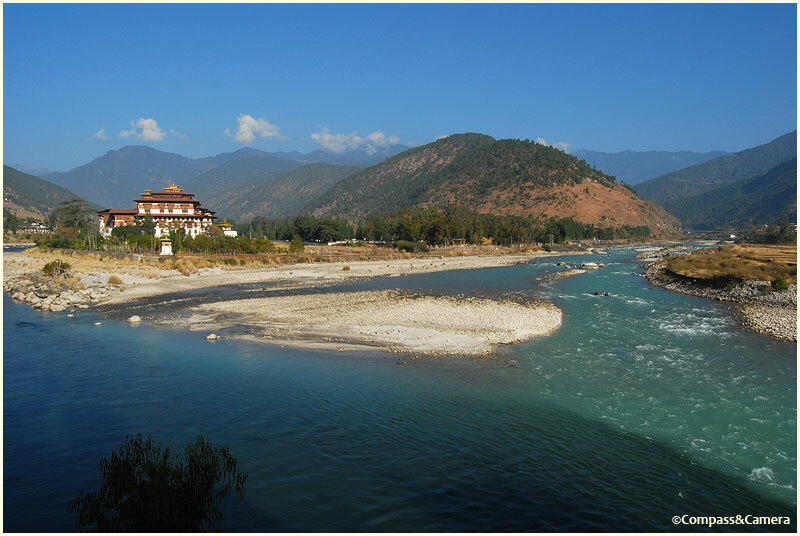 This really is the essence of the beauty of Punakha Dzong — that its presence is harmonious with the landscape yet so grand and significant to those within and around it. 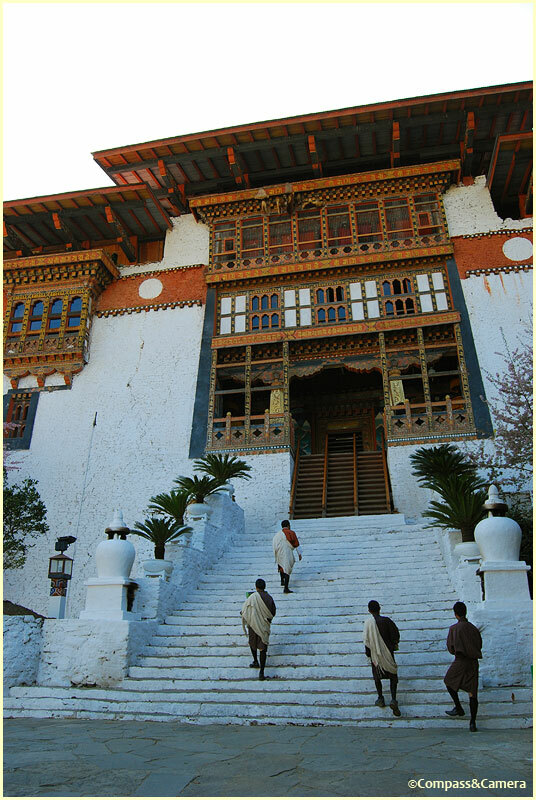 I walked beyond the entry and down the stairs to the gardens on the east side of the dzong. I wanted to get a photograph of the entire structure. I backed up as far as I could but I still couldn’t capture it full frame, as Kinga provided scale standing on the steps at lower right in the photo. He looks so tiny! The north entrance has two steep staircases — one of which is wooden and can be pulled up to deny entry to any unwelcome visitors. 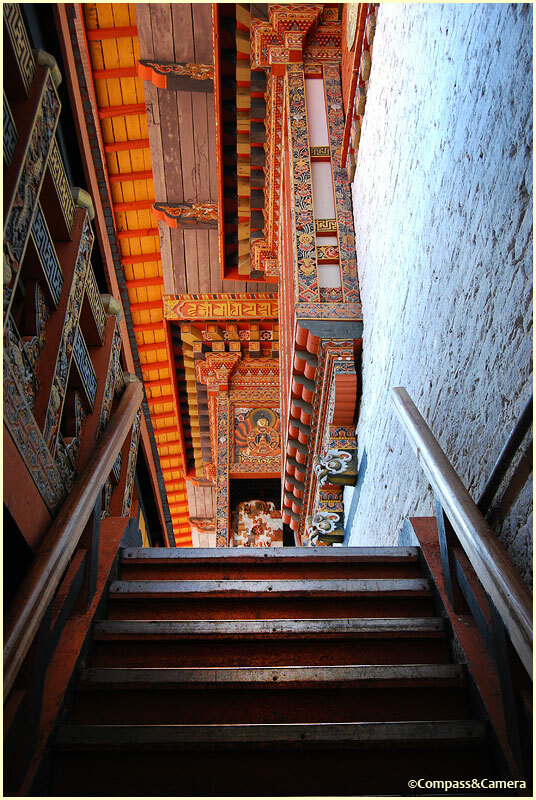 We climbed up, reaching the landing with a walk-around prayer wheel and beautiful painted murals throughout. 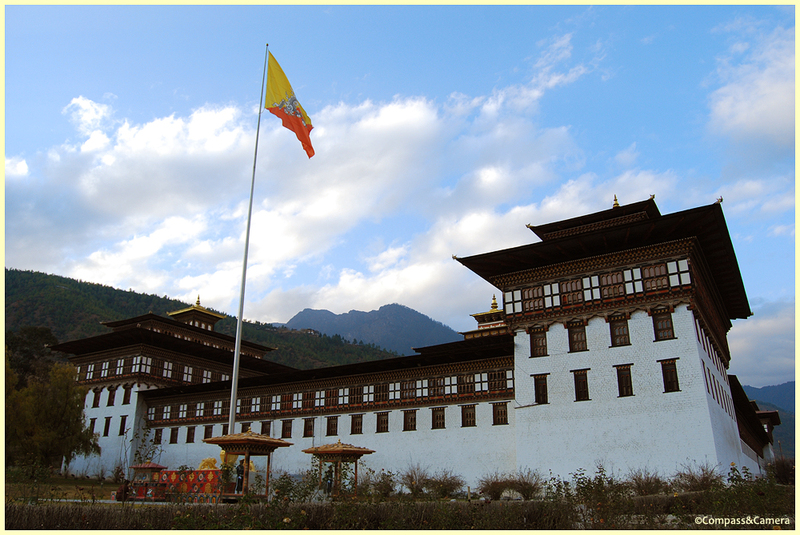 Punakha Dzong is unique in having three docheys or courtyards (rather than two). 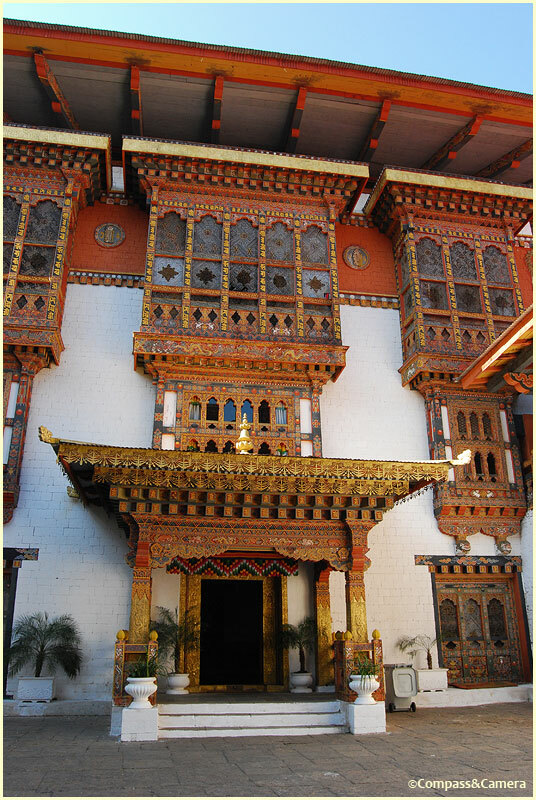 The first courtyard accommodates administrative offices, monks quarters surround the second courtyard, and the third courtyard has a temple and assembly hall. 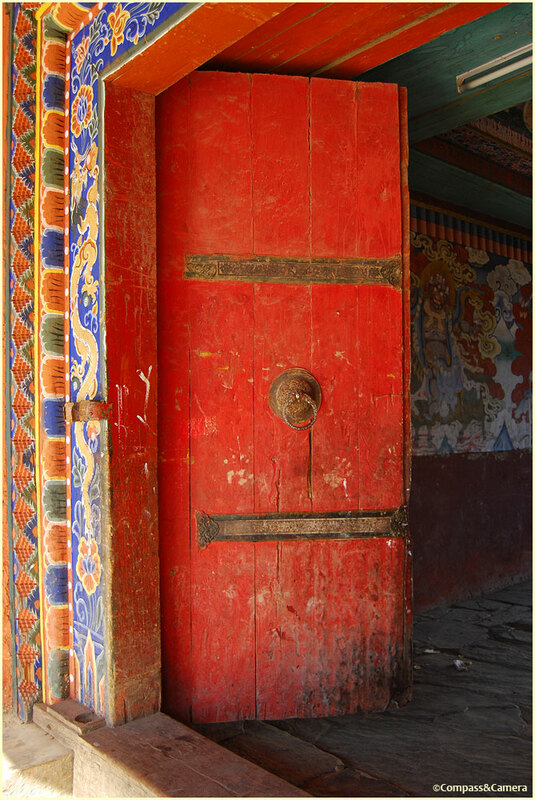 No matter where you are in Punakha Dzong, significant doorways and staircases are all around. We removed our shoes and Kinga led us through the assembly hall where about 30 young monks were reciting texts in a continuous hum. They tried to sit still and ignore the handful of tourists walking clockwise around the room, but I caught a few curious glances as we admired the interior. We received a blessing, putting the water in our hands to our mouths and then pouring it over our heads. Kinga told us the story of Buddha’s life as portrayed by the murals on the north wall. Having toured the interior, we returned to the first courtyard and descended the staircase, passing this incredible embossed metal work on the front door. 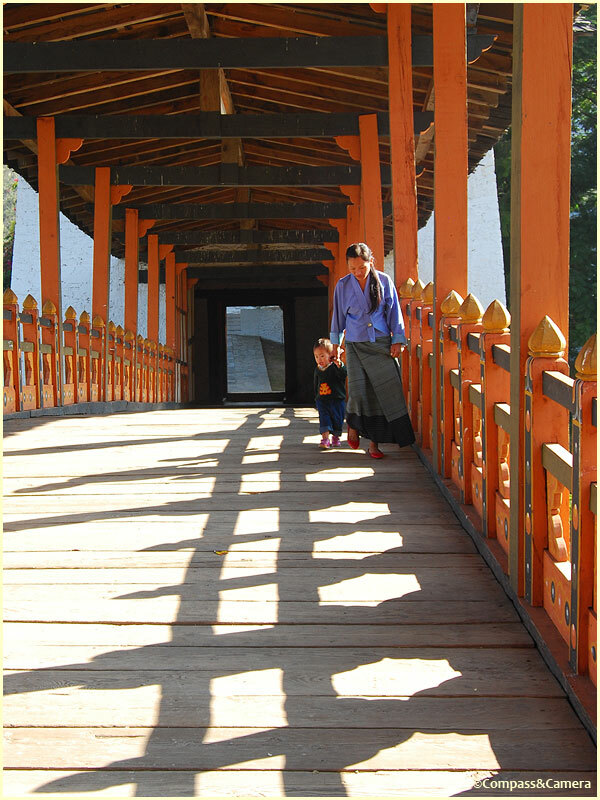 Outside, the morning was heating up as families and monks came and went across the bridge in colorful ensembles. 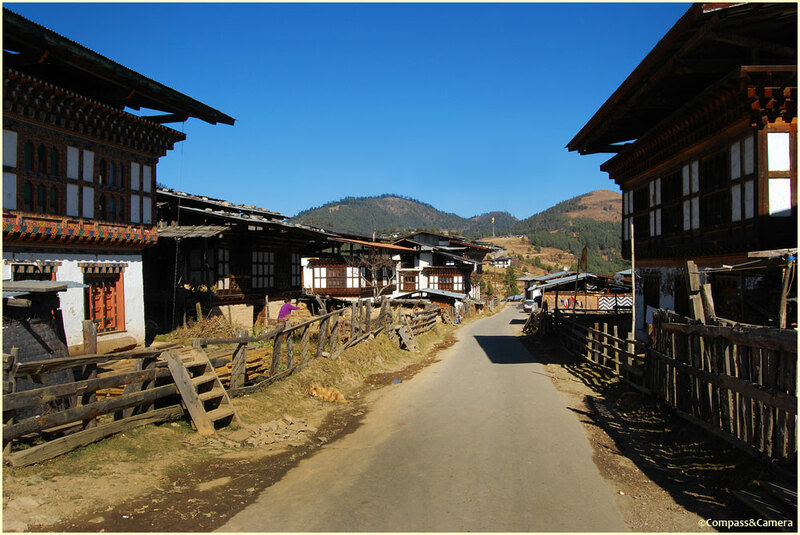 After just a few more photos of Punakha Dzong we were back on the road to Thimphu, having seen some breathtaking sites in Punakha and Phobjikha Valley. 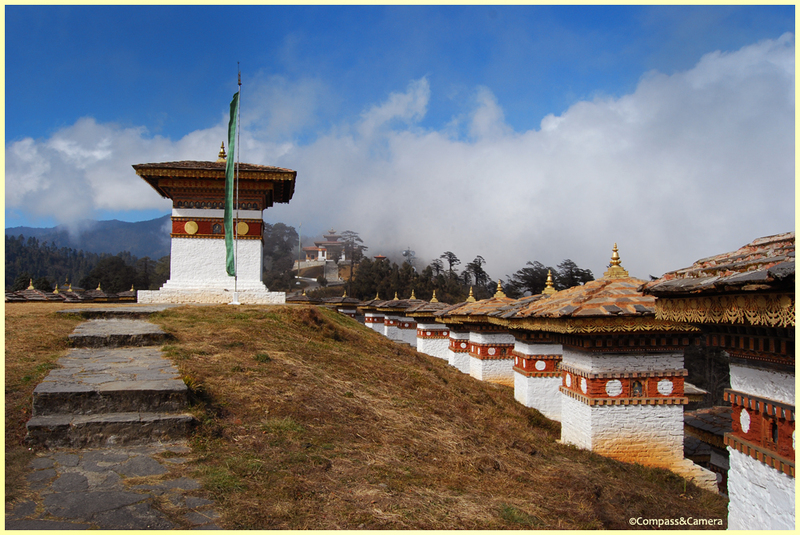 Crossing Dochu La Pass and its 108 chortens once more, the skies were clear revealing Bhutan’s Himalayas to the north. 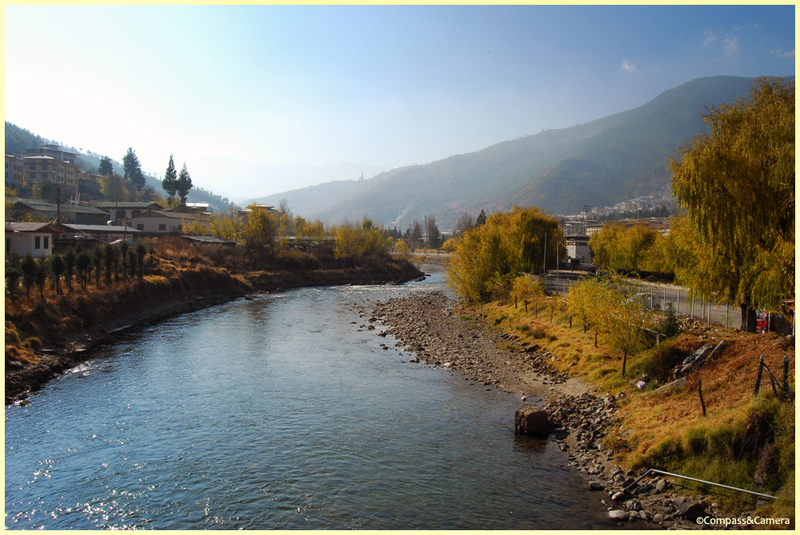 We reached Thimphu in the early afternoon, and met up again with Fin, owner and founder of Bridge to Bhutan. We shared the details of our fascinating trip over great pizza (yes, pizza!) and salad at Season’s Restaurant. I highly recommend this quaint eatery if you find yourself craving a little variety amidst the Bhutanese buffets. 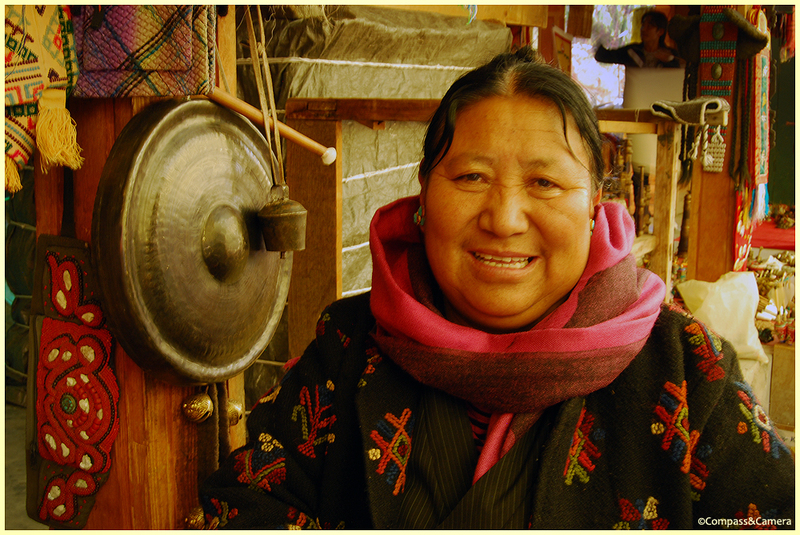 We bid a fond farewell to Fin and set out on an afternoon of shopping before heading to Paro for the night. 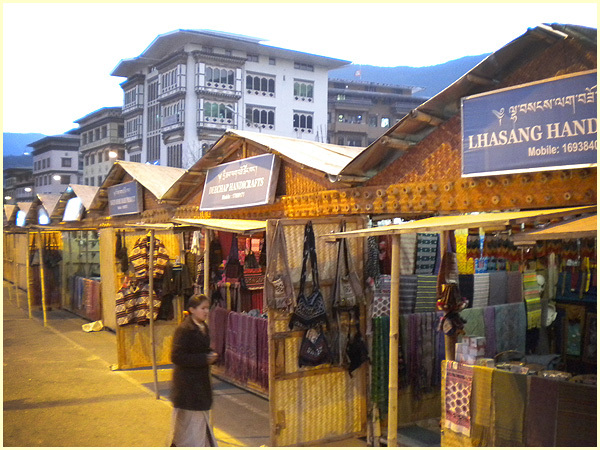 Shopping in Thimphu was surprisingly good — the National Handicrafts Emporium sells many different fixed-price items (rugs, shawls, wooden bowls, boots, paintings, jewelry) with the guarantee that everything they sell is made in Bhutan. 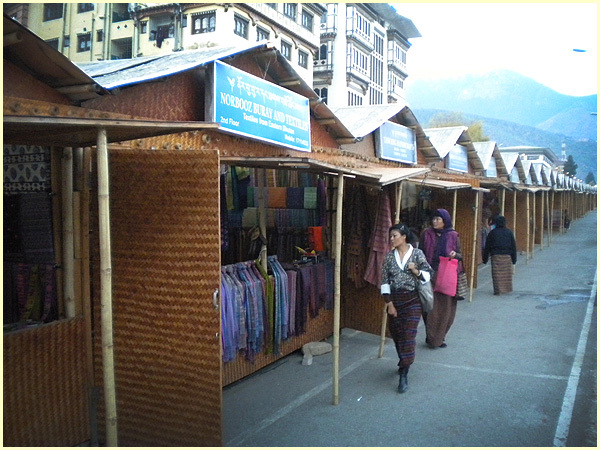 The Bamboo Stalls have purses, bags, table runners (bought one), scarves, shawls, jackets, wood carvings and lots of great other souvenirs to take home. Many prices are fixed, but sellers usually offer a small discount if you show interest in something. Go early — the cold nights shut down the stalls shortly after dusk. And that brings me to the Bhutanese boots. Yes, boots. I became mildly obsessed with them during the six days I was in Bhutan. You will not find boots like these anywhere else in the world, which is why I think I was so enamored with them. They are embroidered, colorful, extremely decorative and usually very tall (just Google Image “Bhutanese boots” and you’ll see what I mean). K5 (the current king) is often wearing these boots in his stately portraits. 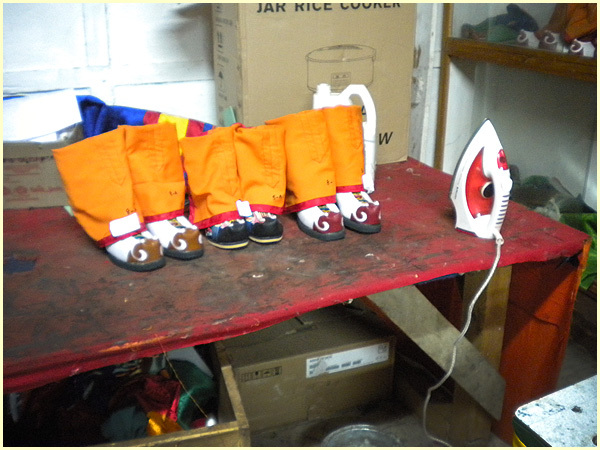 They look like the boots of a court jester or maybe a circus performer with their swirls, stripes and embellishments. Awesome! 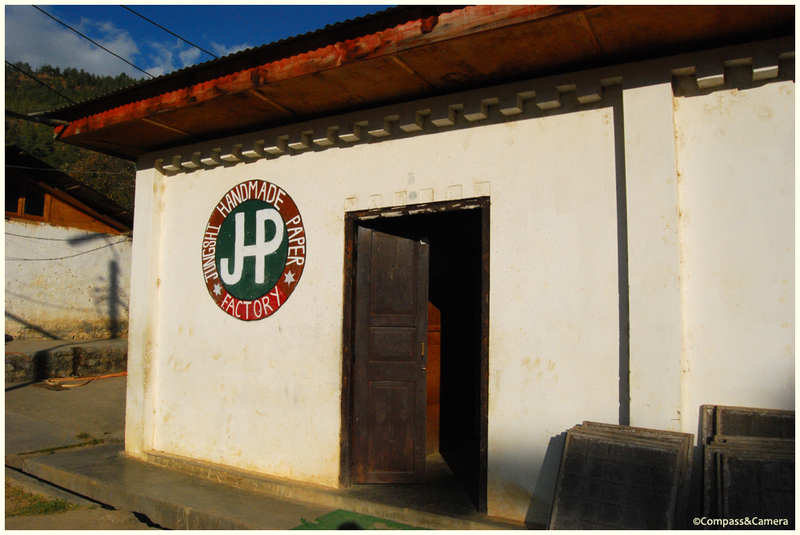 My obsession turned into a search for a boot shop, which we located in Thimphu after dark. 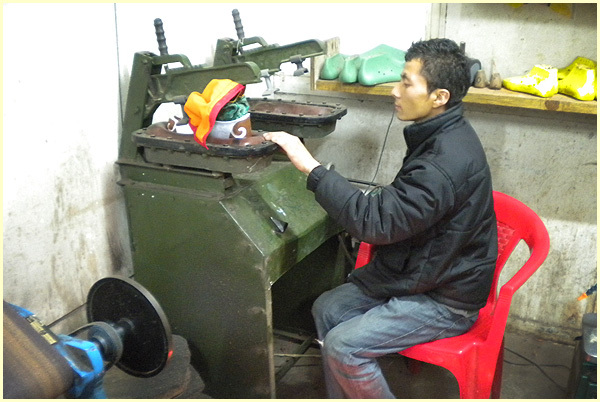 We entered the shop where boots were being made in custom sizes and colors, awaiting pick up by their lucky owners. 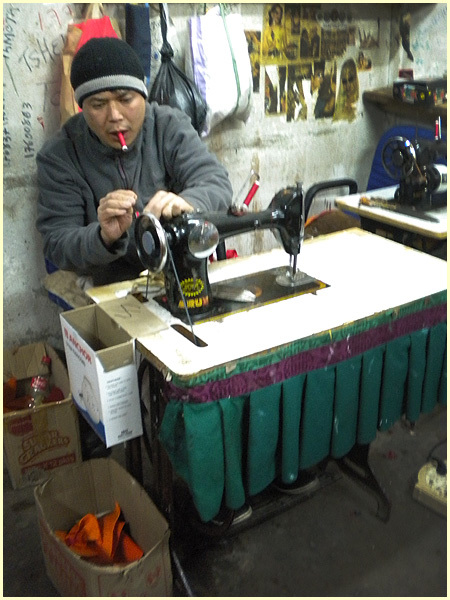 We saw the soles being attached and the sewing machine where the boots were put together. So cool! If only I could have found a reason why I needed these boots! I figured I could wear them in Singapore for a special occasion like Chinese New Year or Formula 1 (hey, with a little black dress? surely no other girl would be wearing them!) but then again I didn’t want to disrespect their beauty, history and purpose. 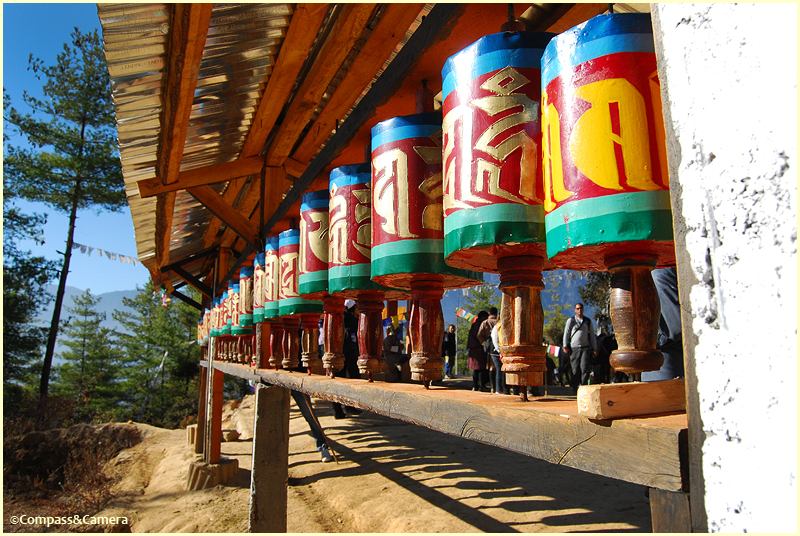 So I decided they were best… left in Bhutan. We said goodnight and I left the shop empty handed. Perhaps next time I go I’ll bring back a pair and put them in a glass case as a memory of the spirit and uniqueness of this country. We drove on to Paro, checked into yet another charming hotel, enjoyed dinner together and departed for Tiger’s Nest in the morning. 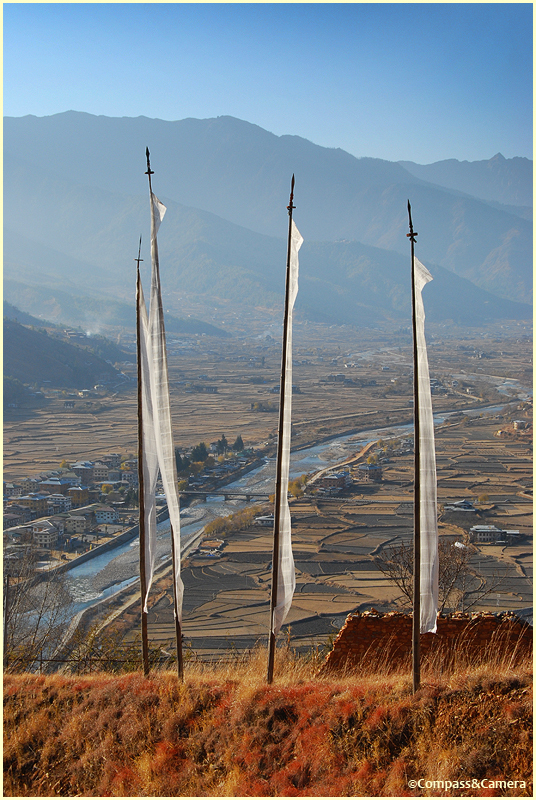 We awoke in Punakha to a crisp, clear morning. The sun illuminated the Meri Puensum Resort, revealing all the intricate details I hadn’t seen when we checked in the evening before. 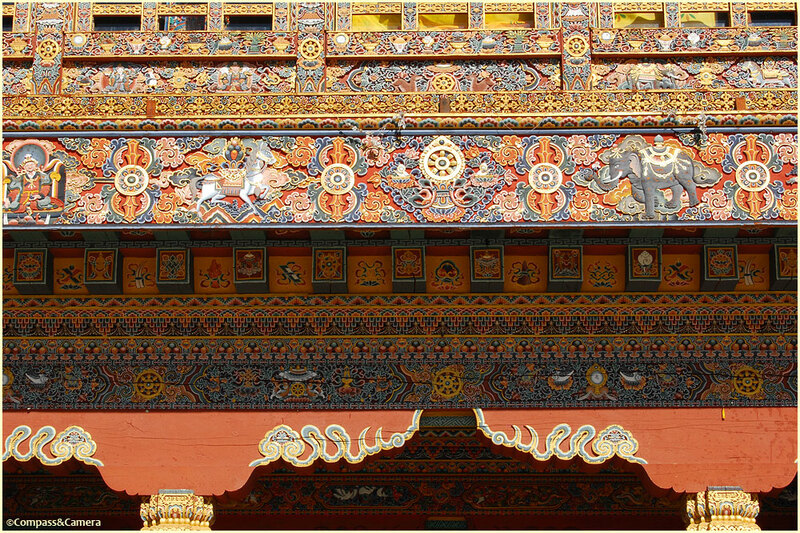 As you can see, Bhutan’s traditional architecture is a magical balance of stone, wood and hand-painted details. Older structures have beautiful time-worn character while newer ones, like this main building at Meri Puensum, often have whimsical, almost fairy tale-like spirit. 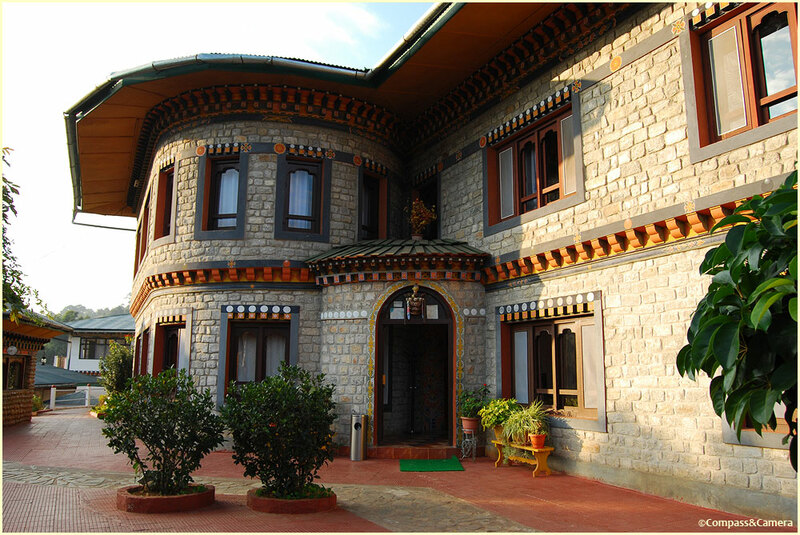 A sense of joy seems embodied in nearly all the architecture of Bhutan. 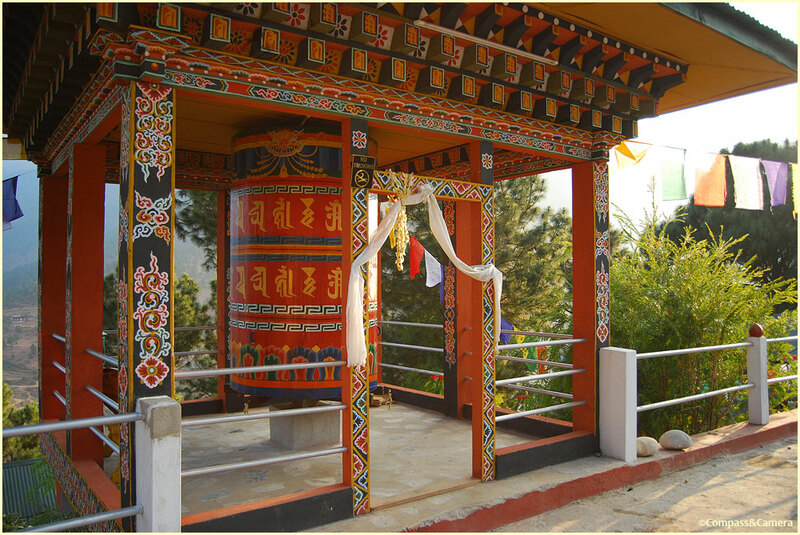 A large prayer wheel sits at the entrance to Meri Puensum, which is located on a hillside with a northerly view toward Punakha. We had an enormous room here with two twin beds, en suite bathroom, sitting area and private balcony with view to the river below. 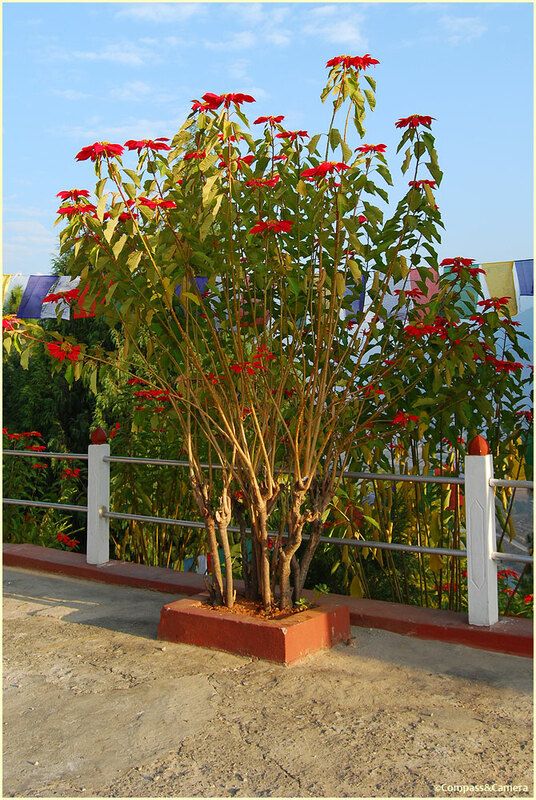 Slopes around Punakha were dotted with intense red leaves of wild poinsettia trees. After a quick breakfast of eggs and toast, we hopped in the car with Kinga (guide) and Kumar (driver) and began our journey to Phobjikha Valley. 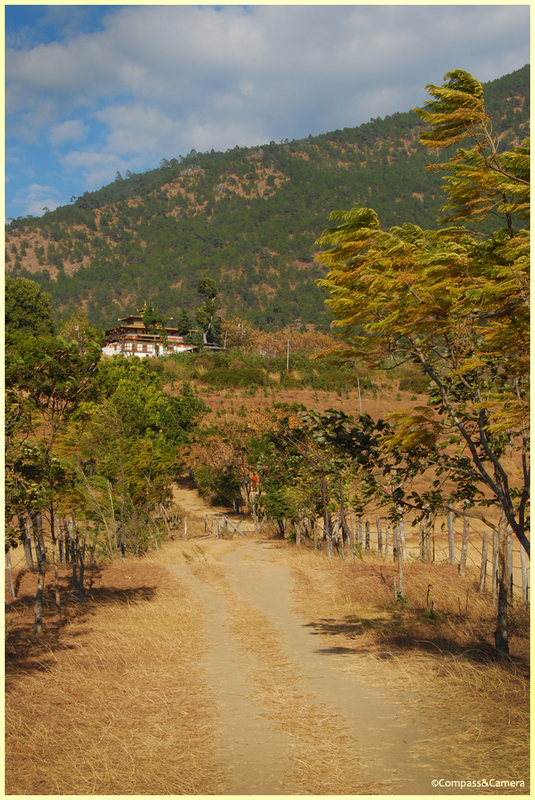 Getting anywhere in Bhutan by land requires patience and perseverance — the twisting, turning road (there is only one going east and west) climbs relentlessly along and over the mountains, until eventually it finds the next valley and barrels to the bottom. 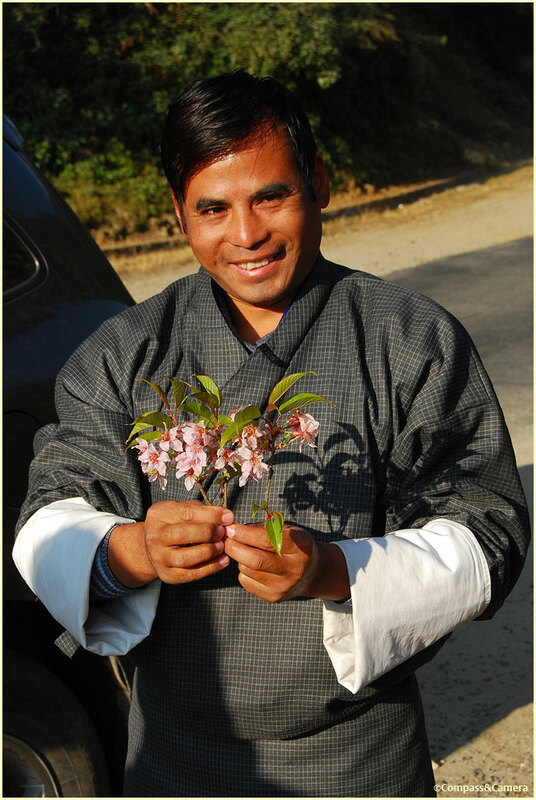 Thirty minutes up the road, we stopped to take some pictures while Kumar gathered some fresh blooms from the roadside to decorate the hood ornament on the car — a touch of beauty for the ride that matched Kumar’s constant smile and happy demeanor. 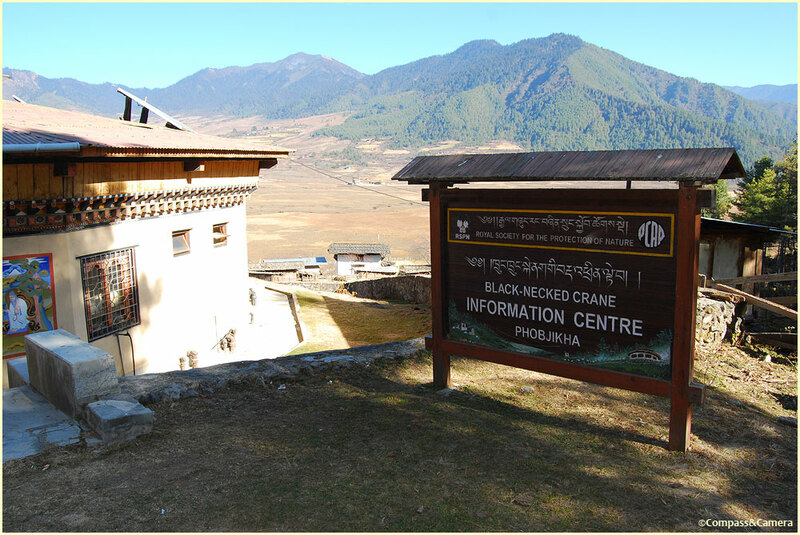 The timing of our trip fortuitously coincided with the arrival of black-necked cranes in Phobjikha Valley so we were headed there to do a bit of bird watching. After over two hours on the road the hills finally parted, revealing a glimpse into the valley. We continued on, arriving shortly thereafter at a small village called Beyta where we started our journey on foot at Gangtey Goemba. 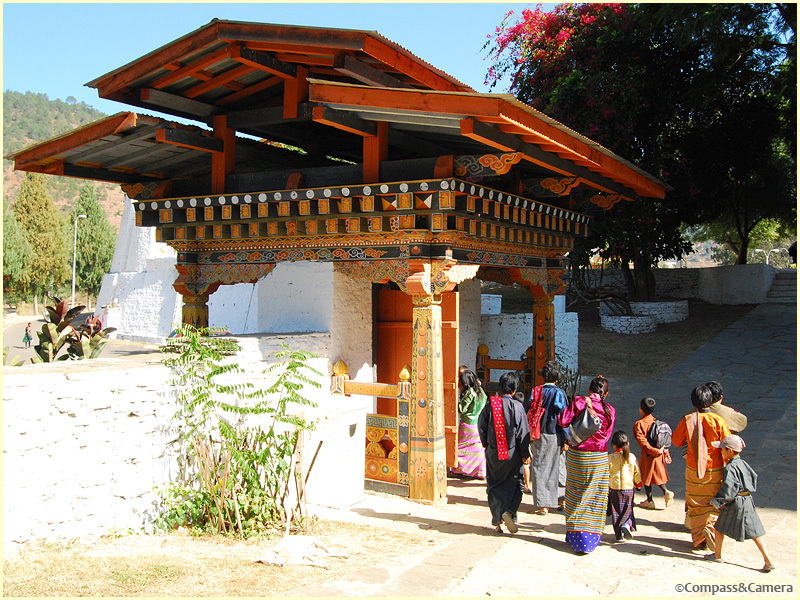 For approximately 450 years, Gangtey Goemba has overlooked the Phobjikha Valley from the top of a hill on the northwest side. 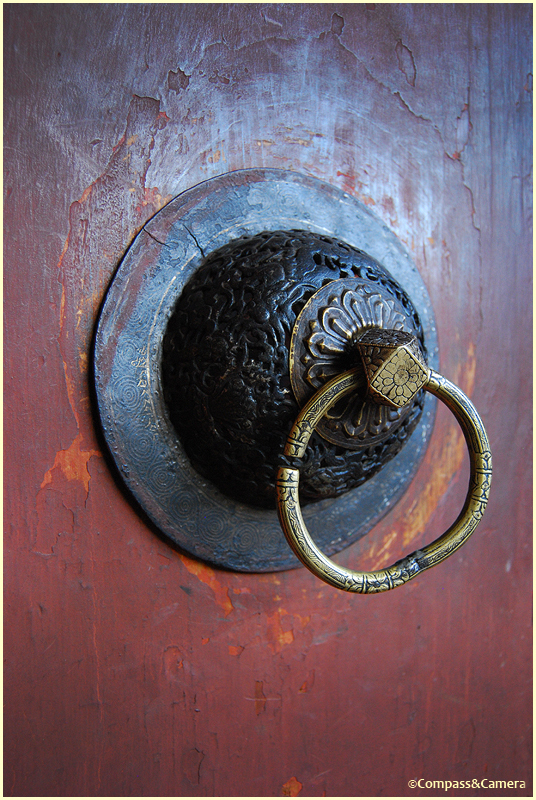 Old, red double doors opened into the courtyard where the prayer hall suddenly appeared in silent grandeur — dominating, awe-inspiring and just… big. White exterior walls accentuated the goemba’s size and angularity. The structure seemed larger at the top than the bottom — articulating outward to a multi-tiered roof with rich, gold detailing and protective deities placed at the corners. The goemba seemed generally not of human-scale, inspired by something larger than life, dwarfing the characters in its doorways. A closer look at the carved and painted woodwork showed astonishing artistry — brush stroke after brush stroke, highlights, shadows and perfect portrayals of symbolic figures and animals. 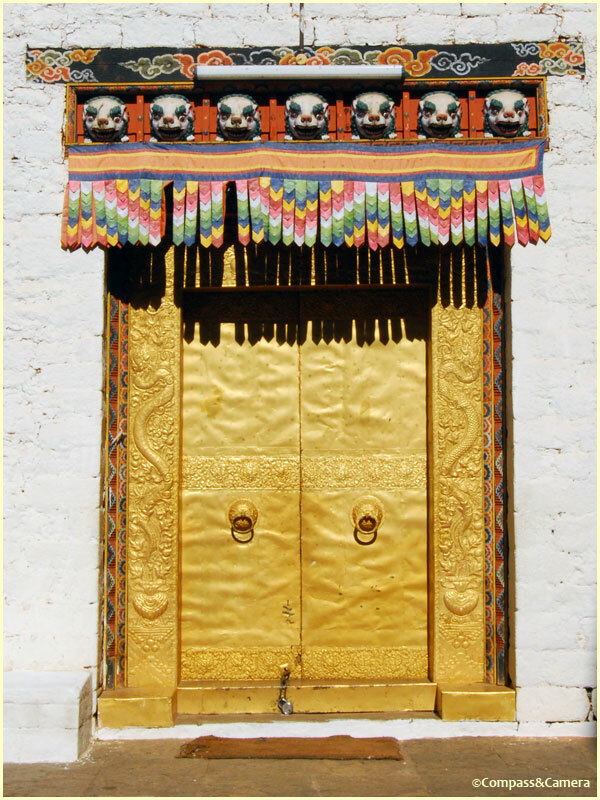 Monks’ quarters were located around the perimeter of the courtyard, each doorway with a number and a decorative swath of fabric hiding the interior. 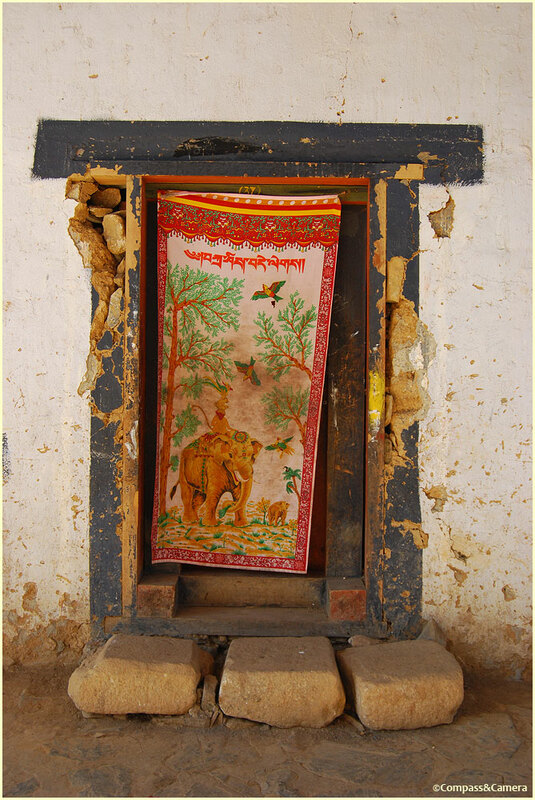 This was room number 37 with a scene depicting the “Four Friends”, a legend of Bhutanese culture involving an elephant, monkey, rabbit and bird and their harmonious relationship with each other and with nature. From the goemba we walked through Beyta, a small village with a central road and a handful of homes alongside. 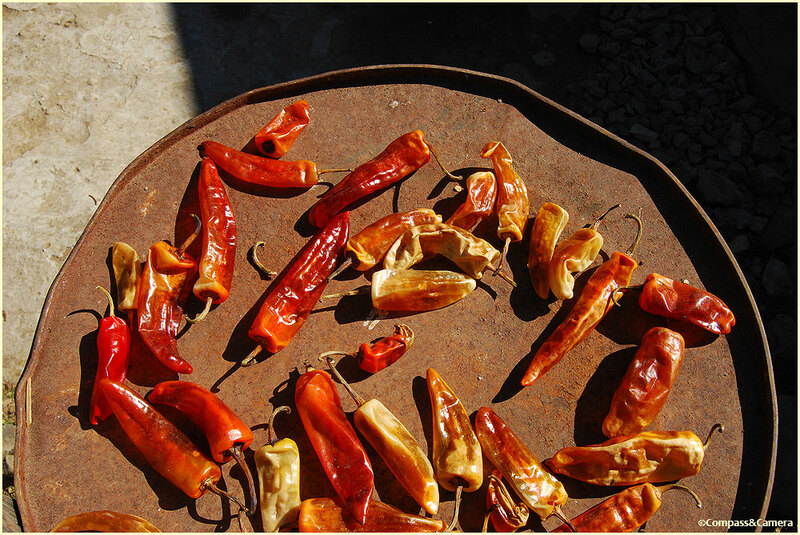 People were out tending to the needs of their daily lives — fixing a roof, hanging up laundry and drying those ever-present chili peppers in the warm sunshine. 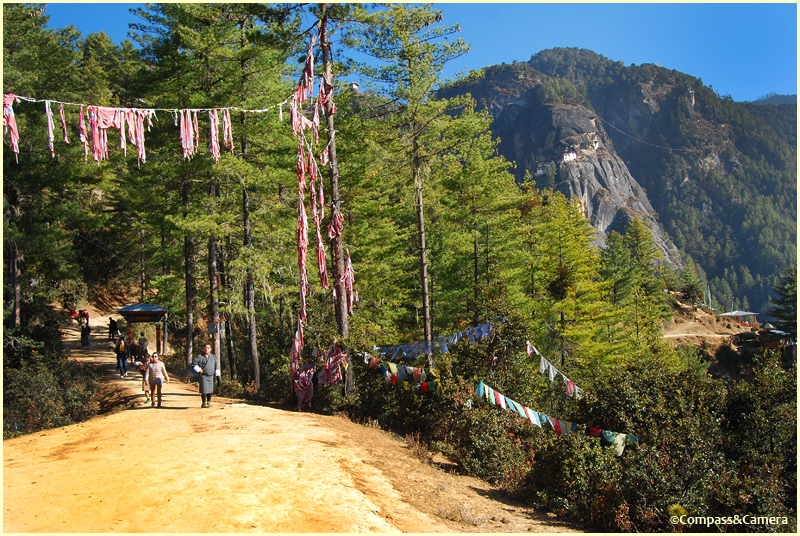 The Gangtey Nature Trail led east from Beyta, down the hill through pine forest and dwarf bamboo. Fences and rock walls defined plots of vegetables, like potatoes and turnips, surrounding two-story homes. Breakfast! 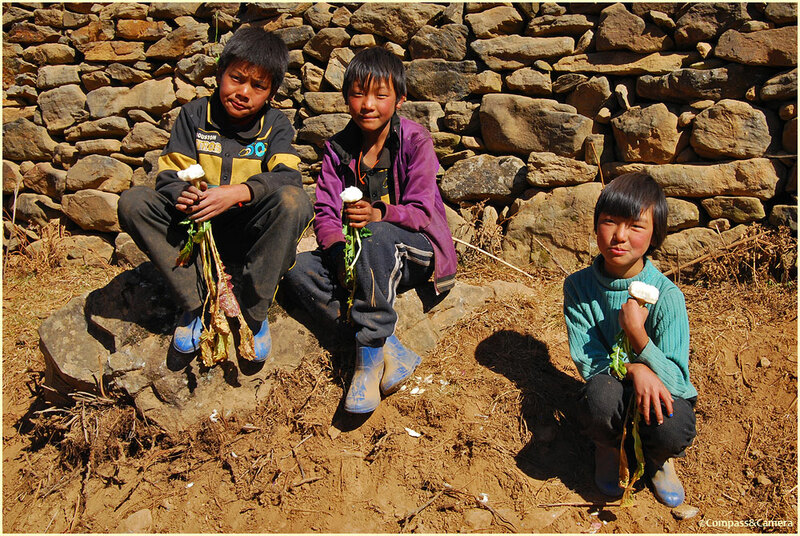 These kids were eating raw turnips just pulled from the ground. Emerging from the forest, the valley opened in front of us. A small deck near an enclave of prayer flags provided the perfect resting spot from which we could look for the nesting black-necked cranes. 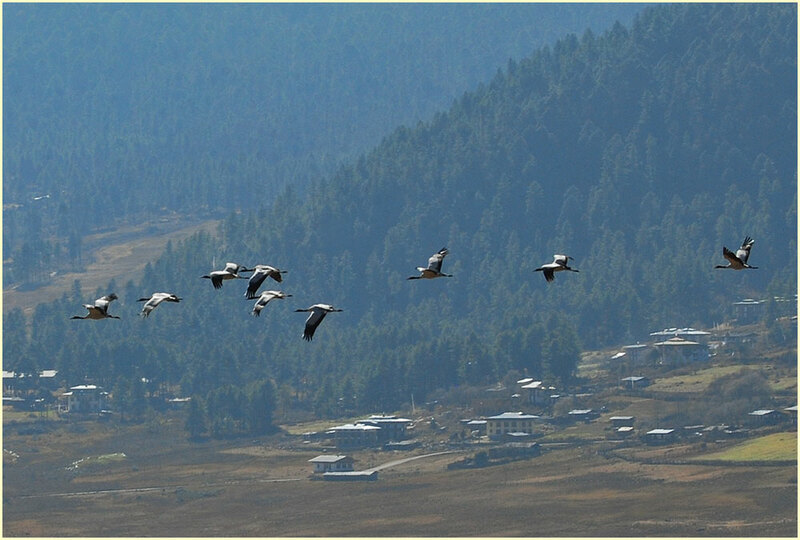 The cranes migrate from Tibet, arriving in Bhutan near the end of October. They winter here in Phobjikha Valley, returning to Tibet around February. 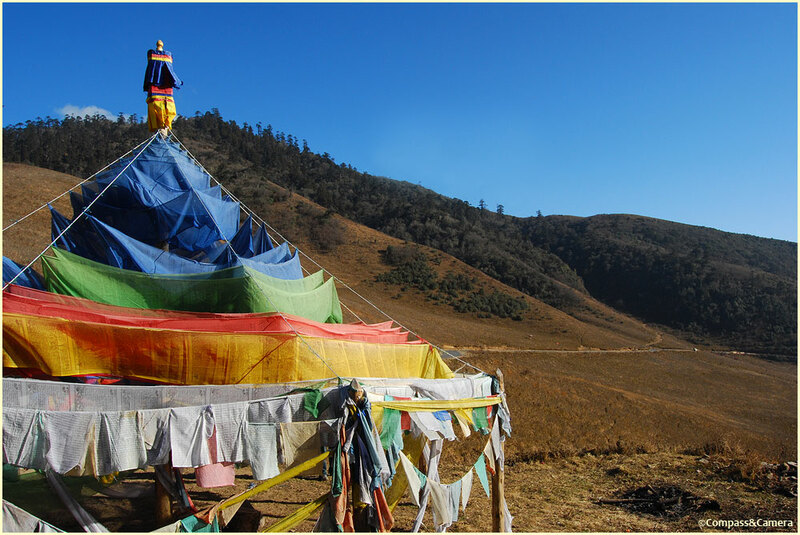 Supposedly, every year the cranes circle Gangtey Goemba several times before leaving the valley on their way back to Tibet. We were quite far away from several groups nesting down the hill, but in the midst of looking at them several other flocks took flight and passed us going east (click any image for a larger view). 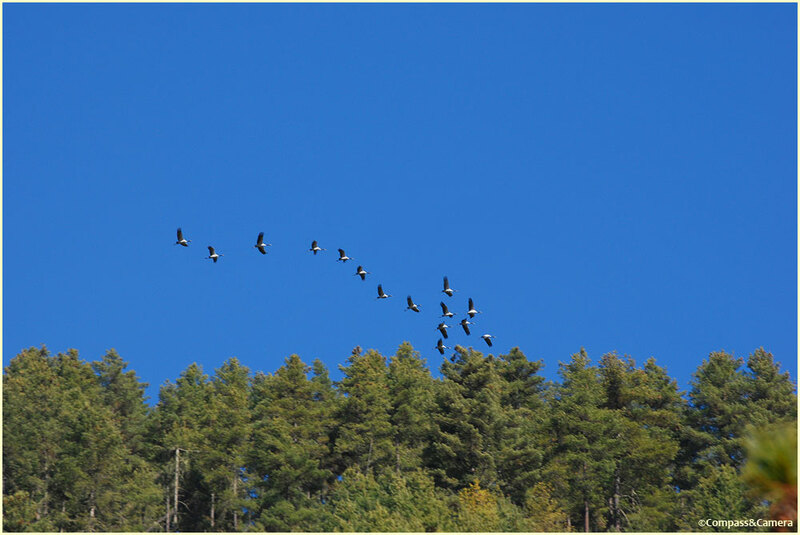 I regretted I didn’t have a more powerful zoom lens to photograph the nesting cranes, but the blue sky was a nice backdrop for the several dozen flying to other parts of the valley. 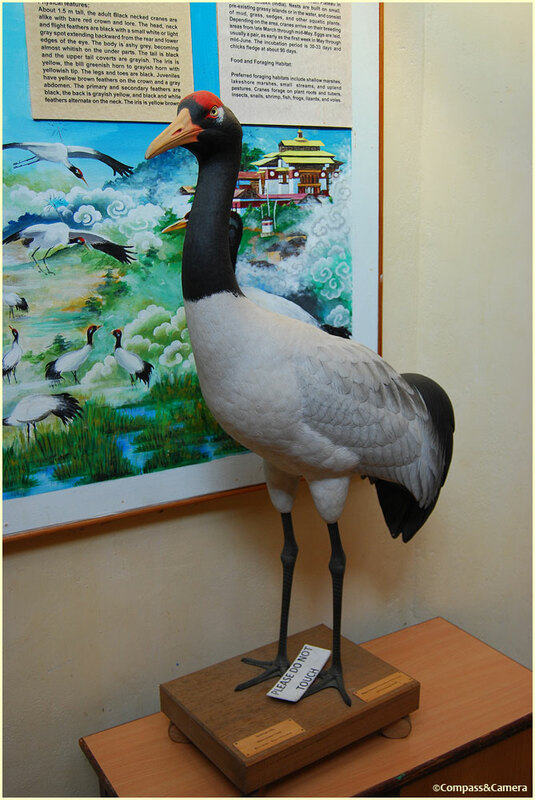 Black-necked cranes are endangered, numbering between 5,500 and 6,000. In the end, it was nicer to just put down the camera and watch them fly over us for there was something intangibly special about plainly seeing this endangered species for what may have been the one and only time in my life. Turning to the east, Kinga led us down the hill further into the valley. 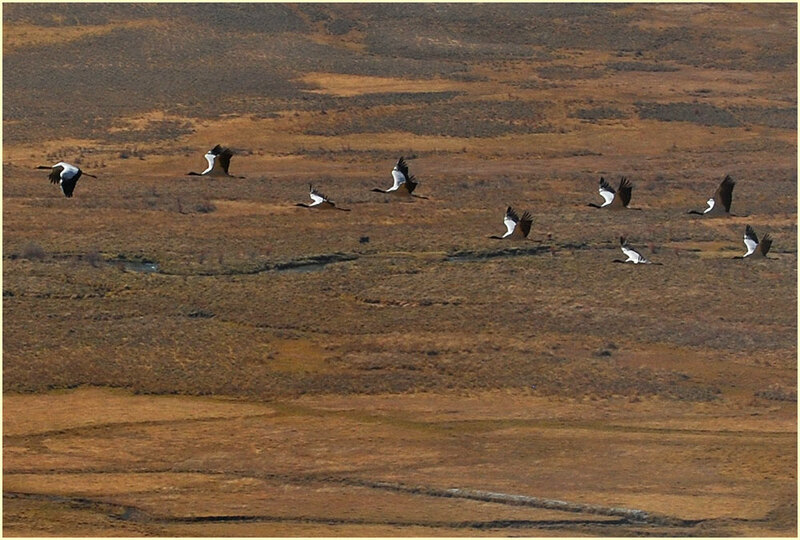 We saw a handful of nesting cranes here and there, sometimes among the grazing livestock. It seems the livestock isn’t helping the health of the valley’s low-lying wetlands — eating the grasses and trammeling paths across the habitat of the black-necked cranes. Reaching the bottom of the valley and the village of Tabiting, we stopped for lunch. It was just the two of us, Kelly and Kelly, along with Kinga and Kumar (we eventually called ourselves K4 in the spirit of the fourth and former king, also known as K4). 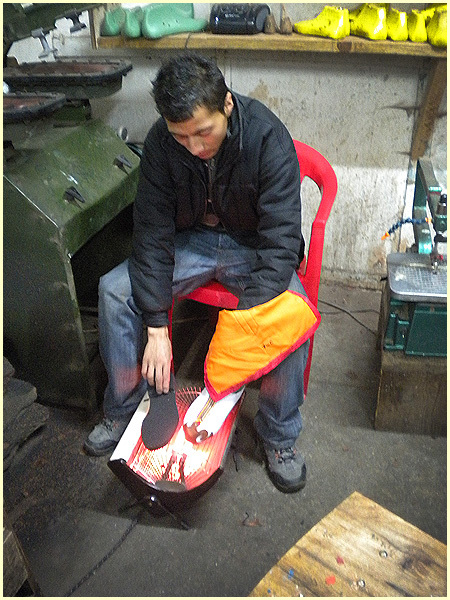 We were welcomed to lunch by a Bhutanese woman who made a place for us to warm our hands and feet by the fire. 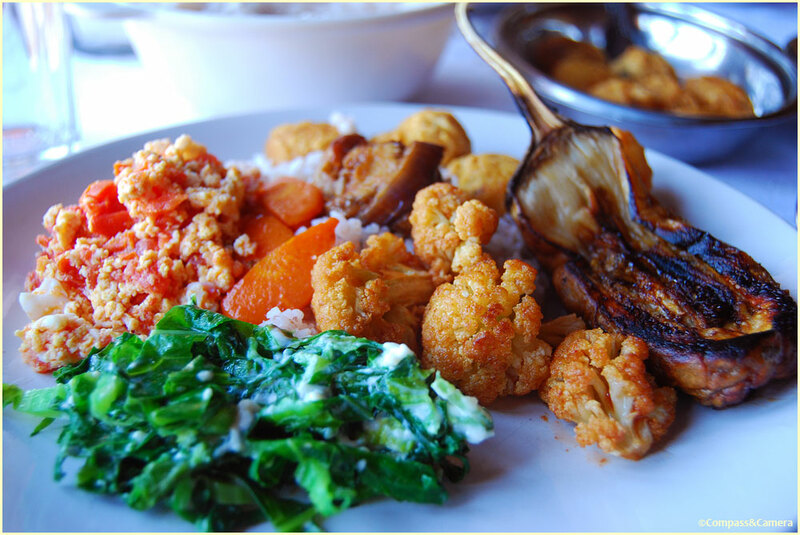 Lunch was a heaping helping of several tasty dishes — potato dumplings (just like tater tots), scrambled eggs with tomatoes, cauliflower, roasted eggplant and a spinach-cheese Bhutanese combo. 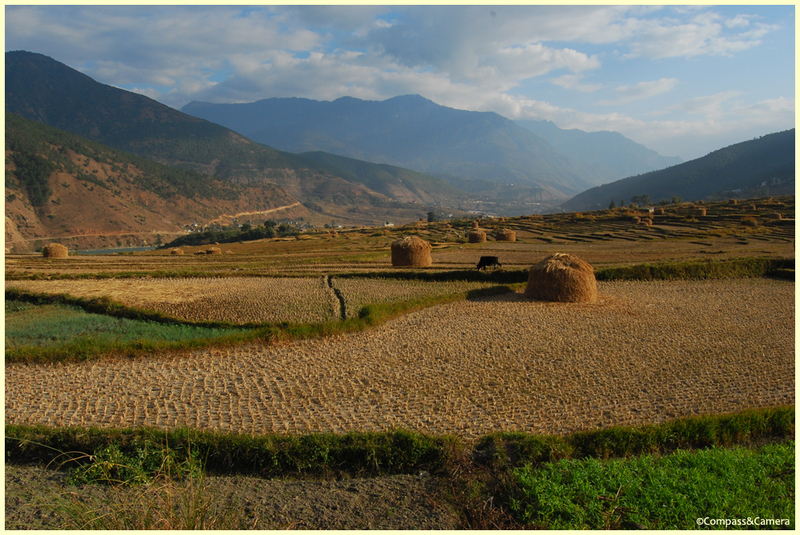 Back on the road, we began the arduous return to Punakha as the sun moved west and dropped shadows over the mountains. 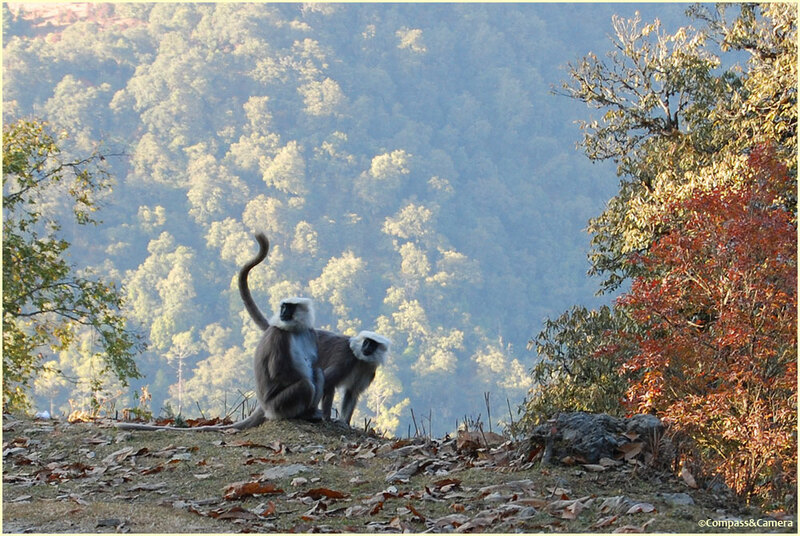 Turning a corner, we encountered a group of gray langur monkeys on the roadside (also known as Hanuman monkeys named after a Hindu monkey-god). Like little old men, tufty gray hair bearded their faces and framed their delicate features. But there was nothing delicate about their movement as they ran full speed and jumped into the trees nearby, swinging from arm and tail in a commotion of sound. Sound… noise. 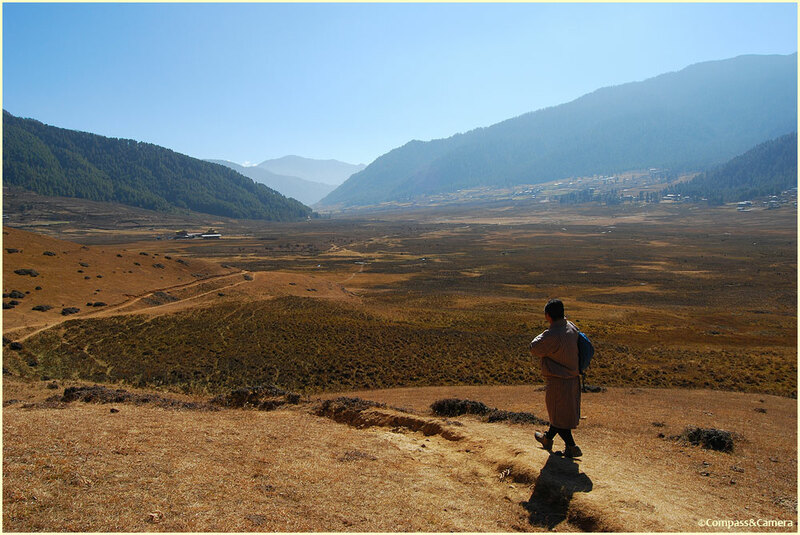 It isn’t often that I visit a place and become aware of the absence of something, but the absence of noise in Bhutan is noticeable. It is such a quiet country. There is no noise overhead — no engines buzzing as aircraft and people fly from one place to another. There is little noise on the ground — just a handful of roads have few cars and trucks compared to anywhere else in the world. There is no raucous nightlife or 24/7 need for convenience that drives this society into the wee hours of the morning. People sleep, wake and live like the rest of us used to. Yes, the Bhutanese have mobile phones, computers and televisions, but they’ve somehow managed to keep out the peripheral madness that often accompanies these advances. 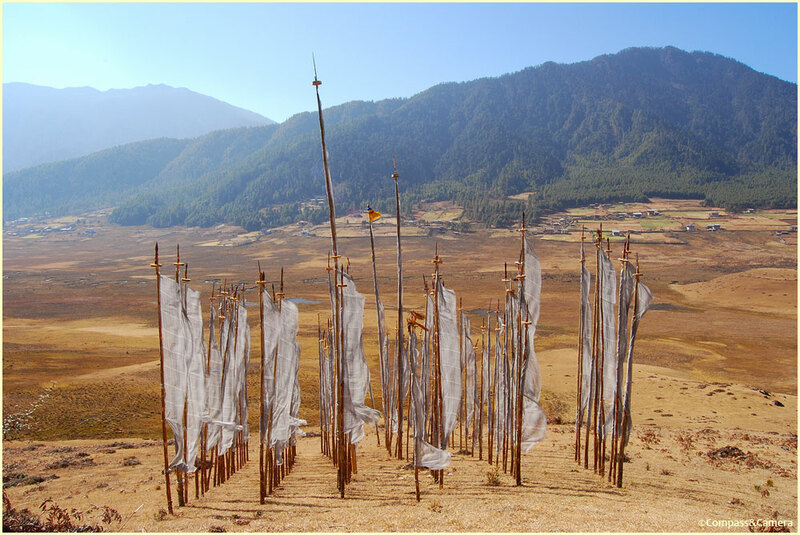 In many ways Bhutan seems to have astutely watched and learned from the rest of the world — taking what works (organic farming, nature conservation, regulated tourism, democratic voting with over 80% voter turnout) and discarding what doesn’t. 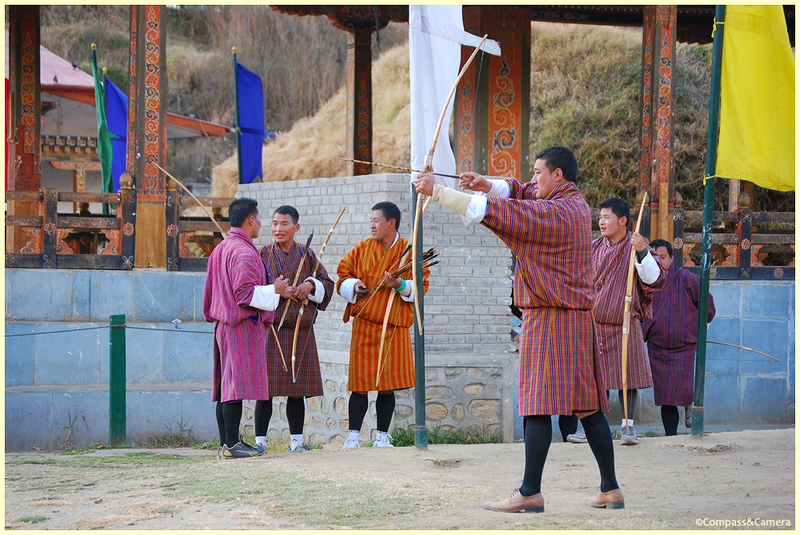 Bhutan is very wisely marching to its own drum, making beautiful music in the process. 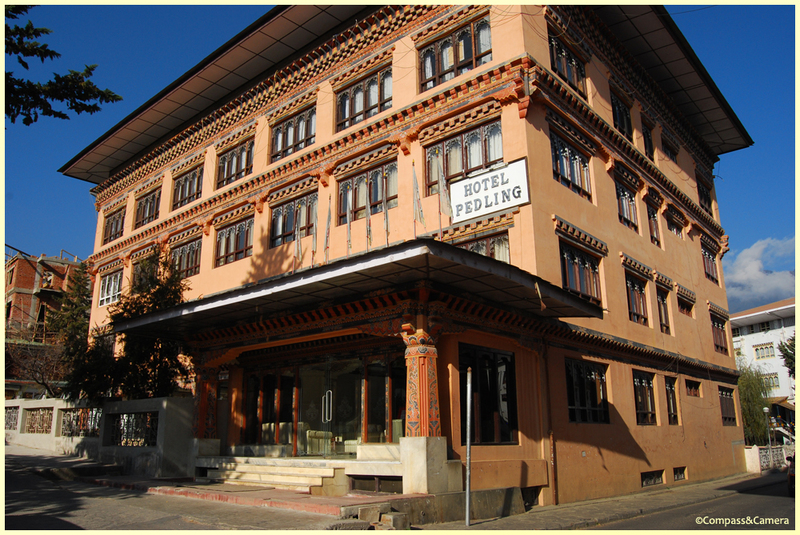 We departed Hotel Pedling around 8:00 a.m., passing through the center of Thimphu. 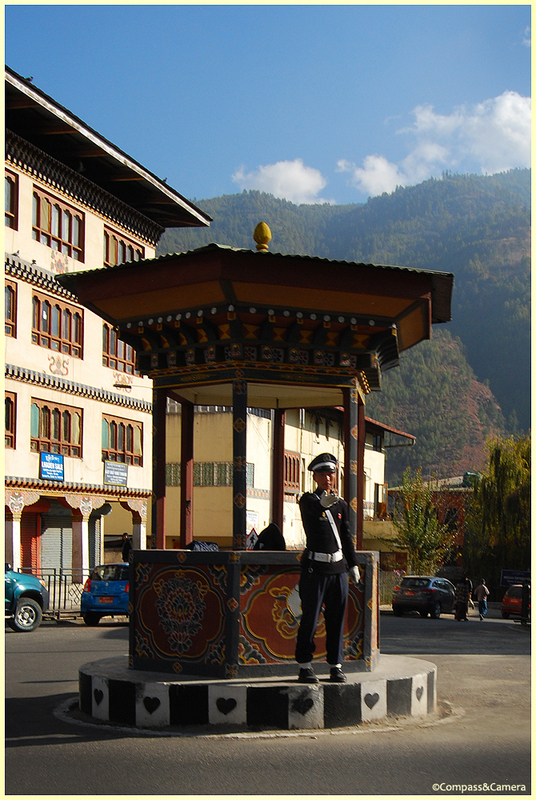 Bhutan has no traffic lights — not even one — so the country’s busiest intersection is controlled by a white-gloved policeman who stands at a kiosk and keeps the traffic moving. We followed his signal and passed through the roundabout on our way to the weekend market. 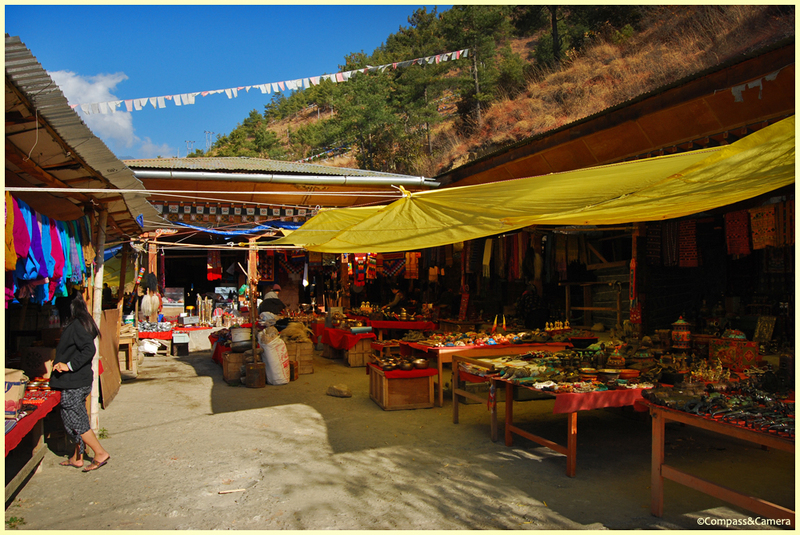 The market is adjacent to the Wang Chhu river running through Thimphu. Before we entered the market I noticed a staircase to a bridge crossing the water. 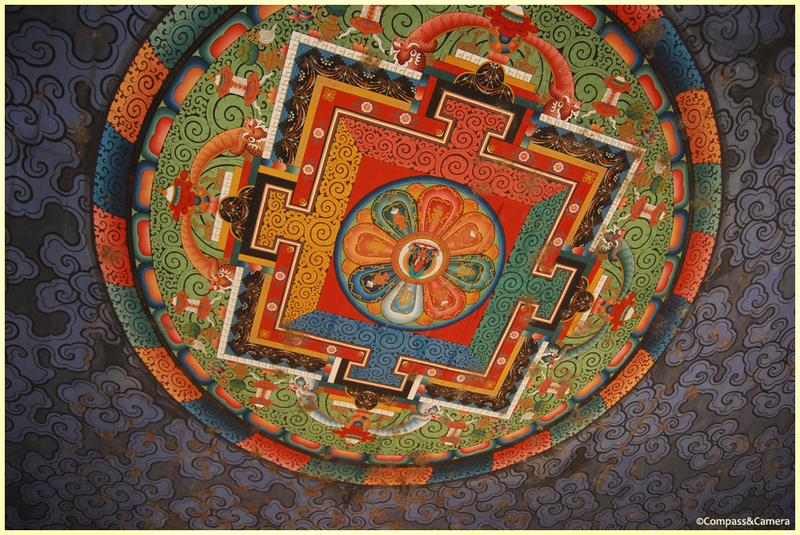 We climbed up the stone stairs to a white brick tower with a blue and orange flower motif on the interior and exquisitely hand-painted mandala on the ceiling surrounded by swirls of indigo. 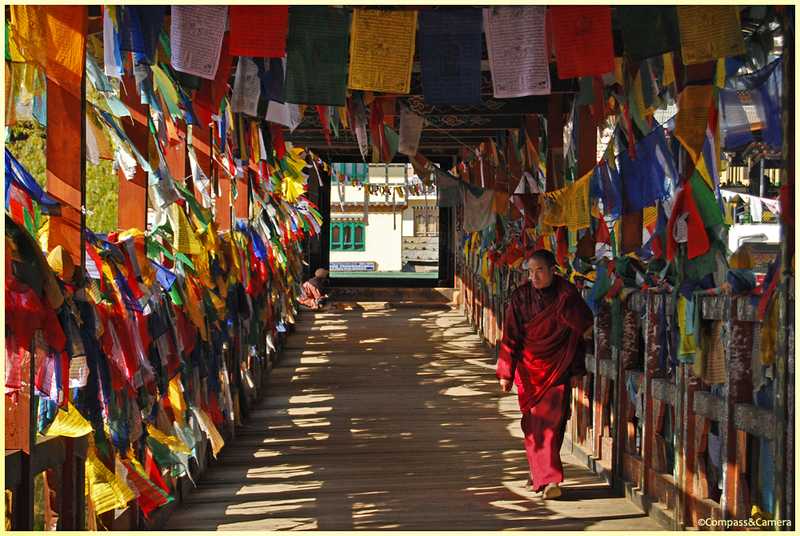 Post and lintel timbers framed the opening to the bridge and morning light filtered through string upon string of multi-colored prayer flags. A peek through the flags revealed a placid view of the river, flowing south toward India. 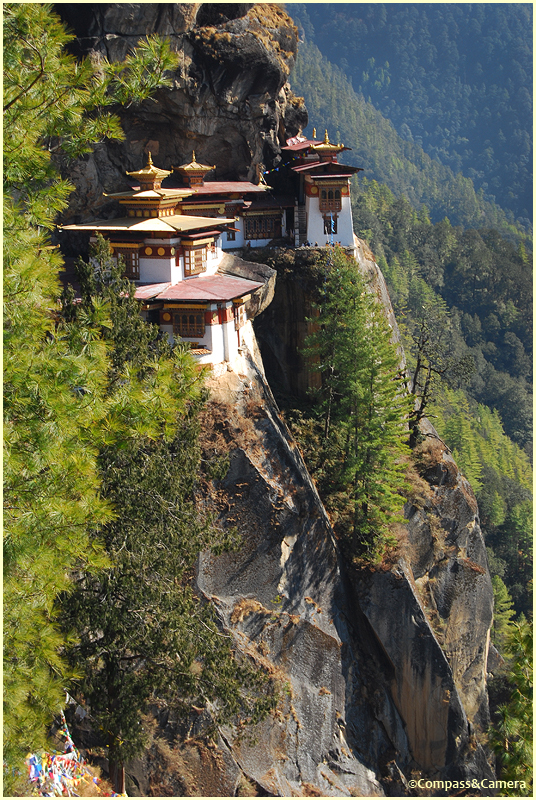 These are the discoveries that make Bhutan such a special place — artistry, thought and beauty in the most unexpected locations. Crossing the bridge, we found an outdoor craft market with treasures from around the region — printing blocks, decorative boxes, wall hangings, singing bowls, masks and tribal jewelry . I bargained (poorly) for a jewelry box beaded with red coral and turquoise. The seller smiled and offered a small discount — I was her first sale of the day and a sign of good luck. She agreed to a photo in return. Back across the bridge (what a photographer’s dream), we entered the Centenary Farmers Market. 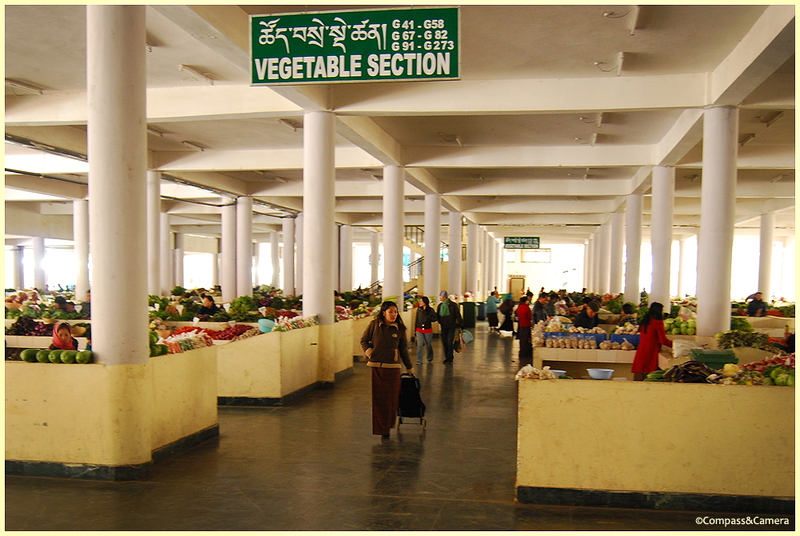 Housed in an open two-story structure, vendors displayed their produce at yellow concrete stalls. Fruits and vegetables were on the ground floor — green beans, eggplant, potatoes, tomatoes, cucumber, lettuce, cauliflower, carrots, ginger, garlic, apples, oranges, bananas. 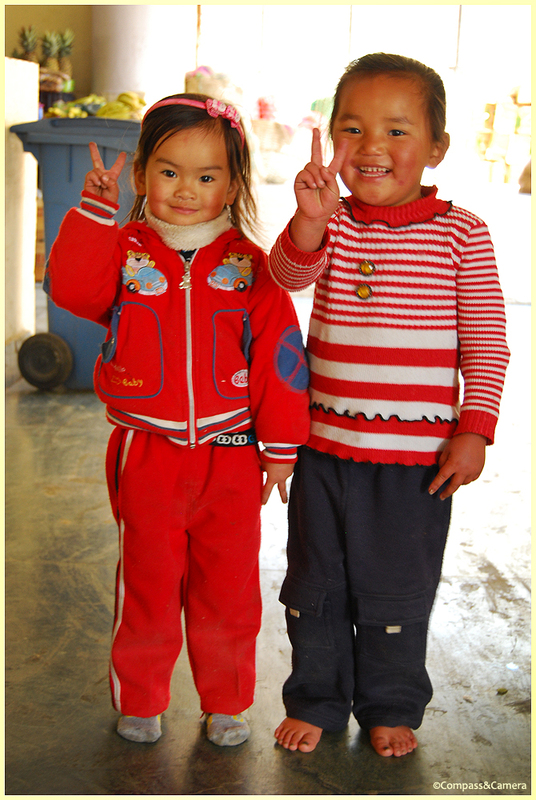 A couple of adorable little girls eagerly struck an informed pose for a photo. The thrill of a digital camera is new to a lot of people in Bhutan, and kids seemed happy to pose and smile for us in exchange for a look at the photo (although these two scurried off as they giggled). There were chili peppers everywhere — piles and piles of chili peppers! 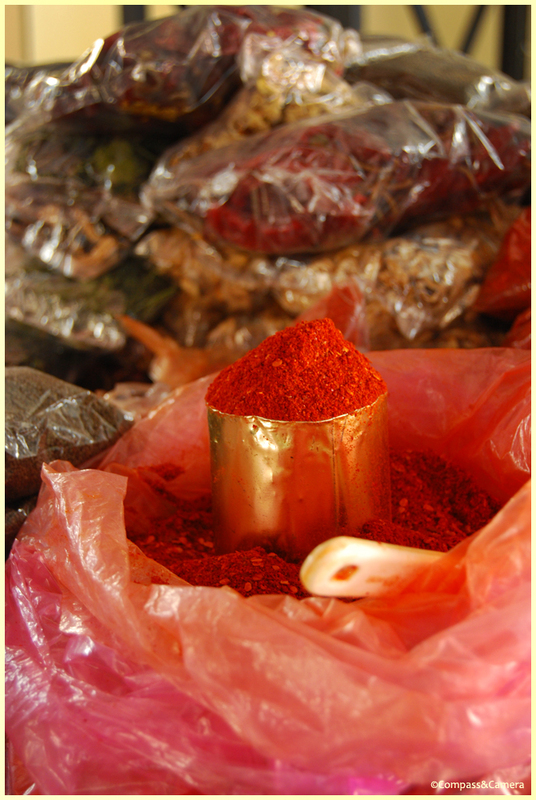 Red, green, fresh, dried, crushed and powdered into a fiery red dust. 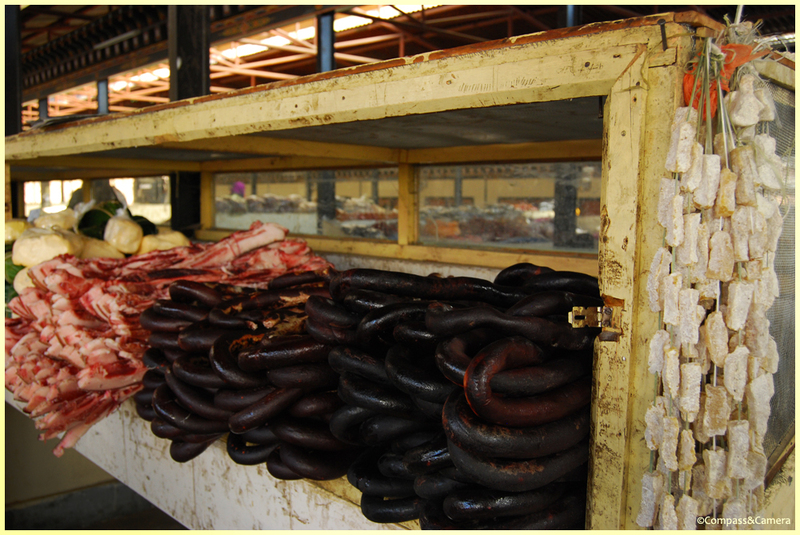 Thick, black sausages were stacked on a shelf like limp tire tubes. 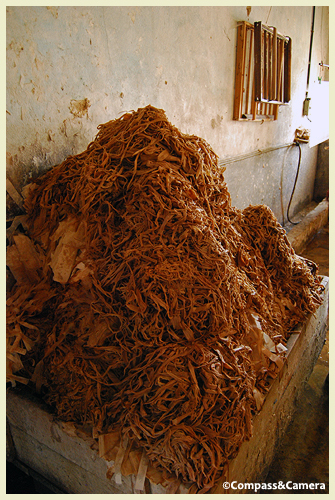 Dried yak cheese hung from strings, while dried fruits and nuts sat in open sacks. 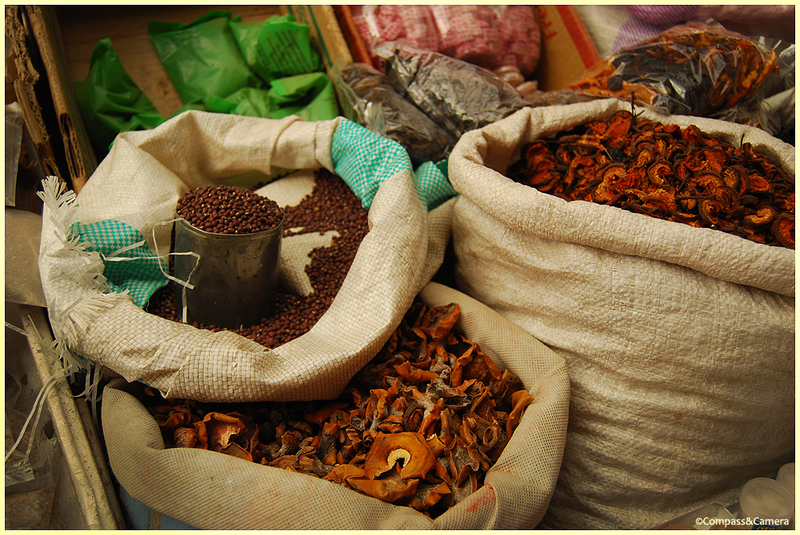 Another part of the market housed a muted palette of grains and rice. It was a Saturday morning scene like so many others in the world — people out to make some money, socialize and do their shopping for the week. 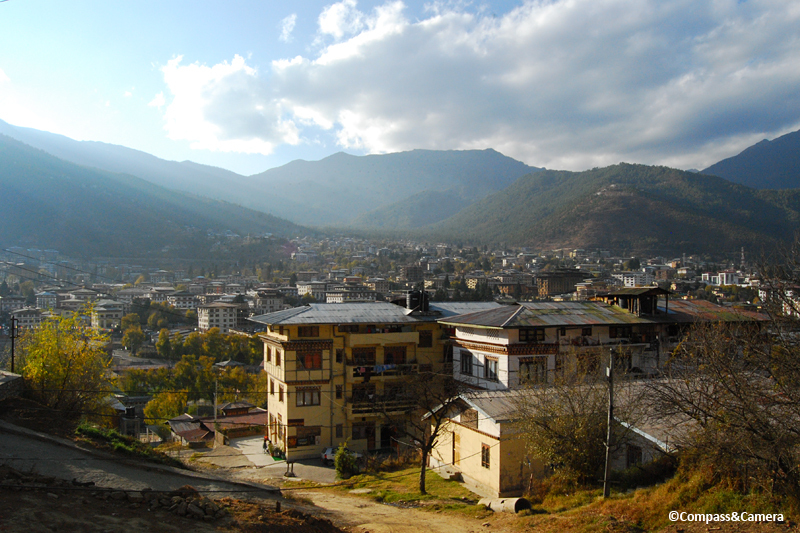 It was time to depart Thimphu for the Punakha valley. I bought a bag of mandarin oranges and we returned to the car. 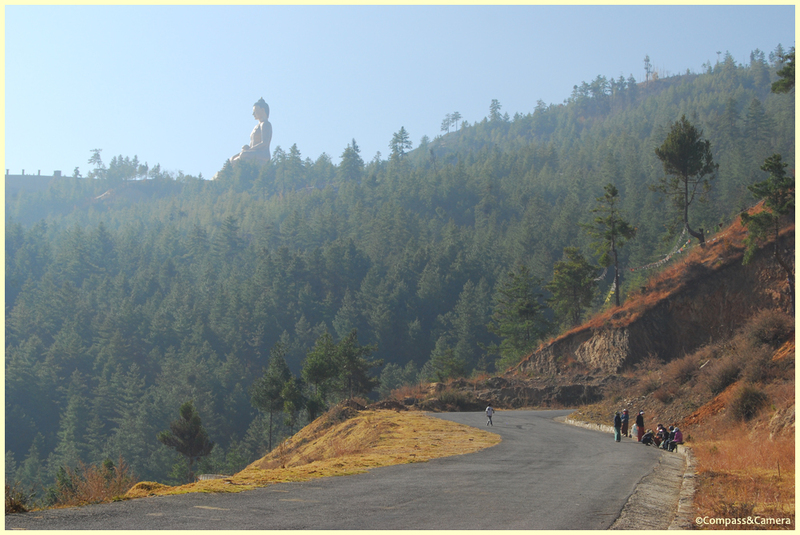 Leaving Thimphu, I spied one last view of the sitting Buddha (top right on the hillside) before we started up the road to Dochu La Pass. 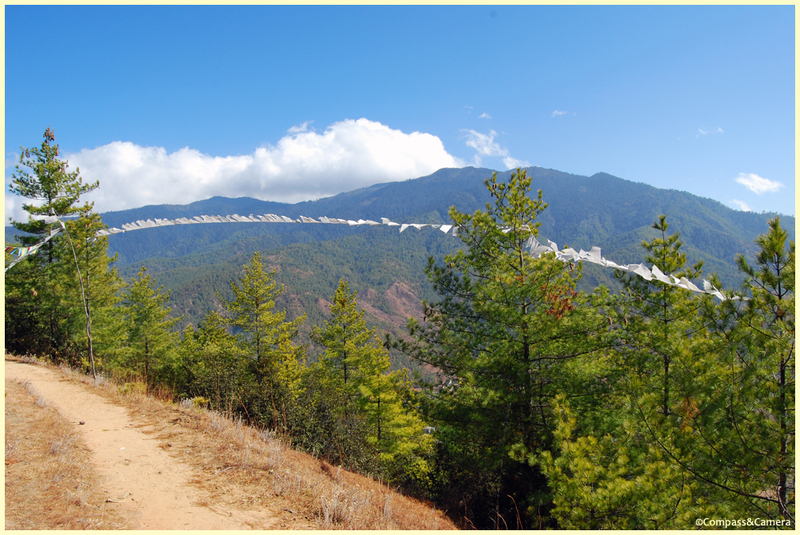 Like so many “one and only” things about Bhutan, there is just one road going east and west across the country. And it is just that — a road, not a highway. 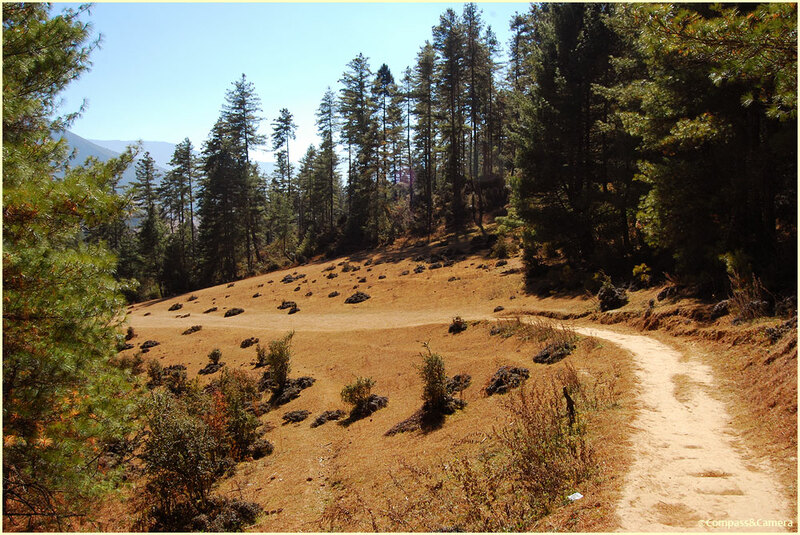 It started out paved but twisted erratically up through the mountains with patches of dirt and mud. Barely wide enough for two cars to pass, the importance of having a good driver became very apparent. His skill and attention were the only things saving us from the trucks passing on the right and the precipice on the left. Think twice before you embark on this road — fear and car sickness are frequent companions. 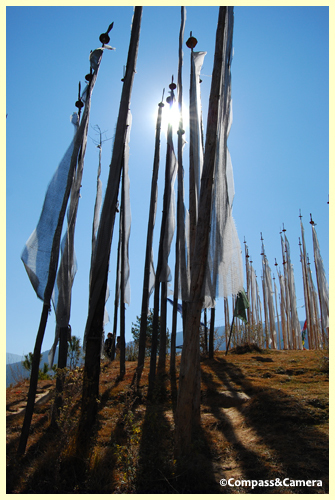 The top of Dochu La Pass (3,140 meters or 10,300 feet) welcomed us with a grand display of 108 white chortens, built in 2005. A short hike to the top of the hill revealed a northeasterly view across the valley to a cyan sky partially filled with shifting cumulus clouds. 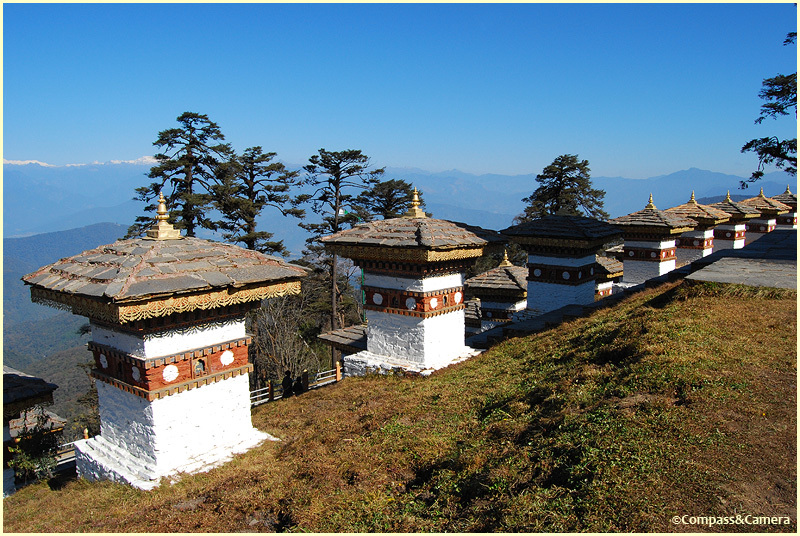 On a clear day you can see Bhutan’s Himalayas, as we would discover on our return. 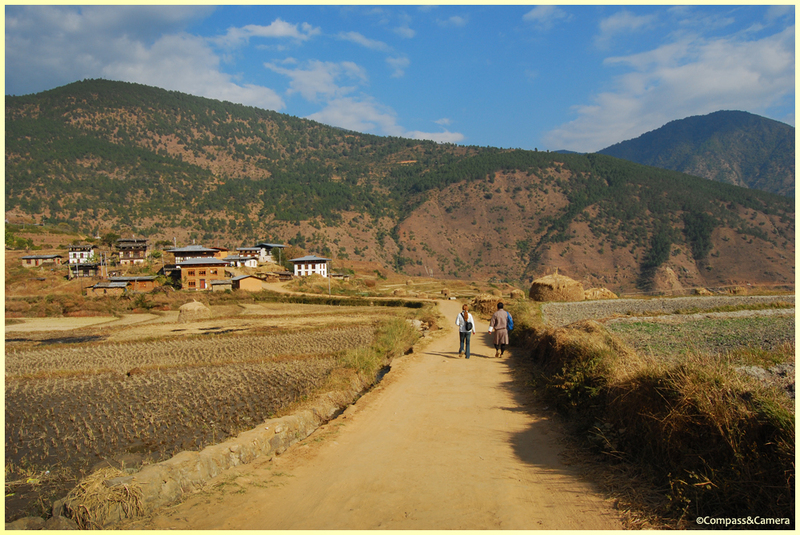 We descended the mountain toward Punakha. 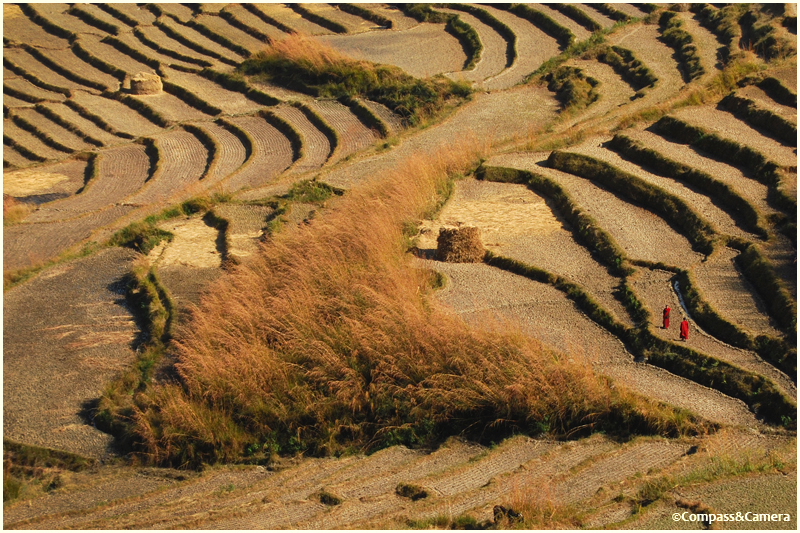 Recently harvested rice fields stepped across the valley toward small clusters of two-story homes. 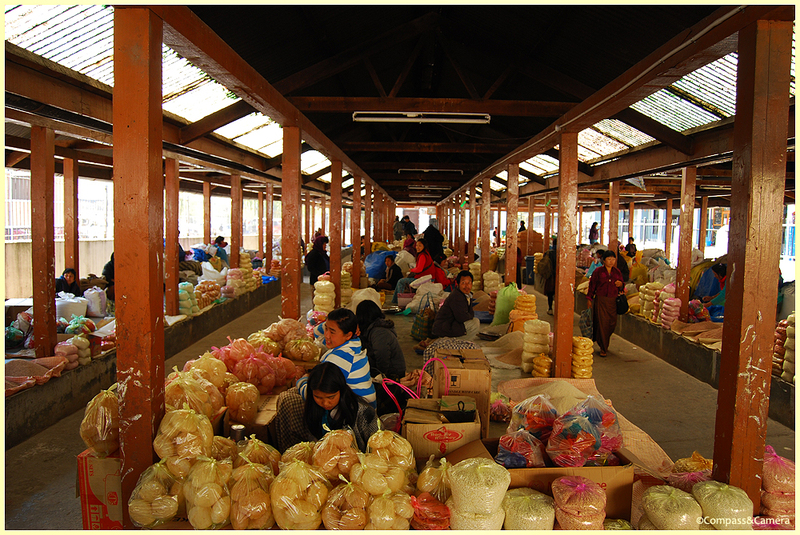 We stopped for lunch at Sopsokha, laughing at the phallus handicraft store with its wooden souvenirs of every size. 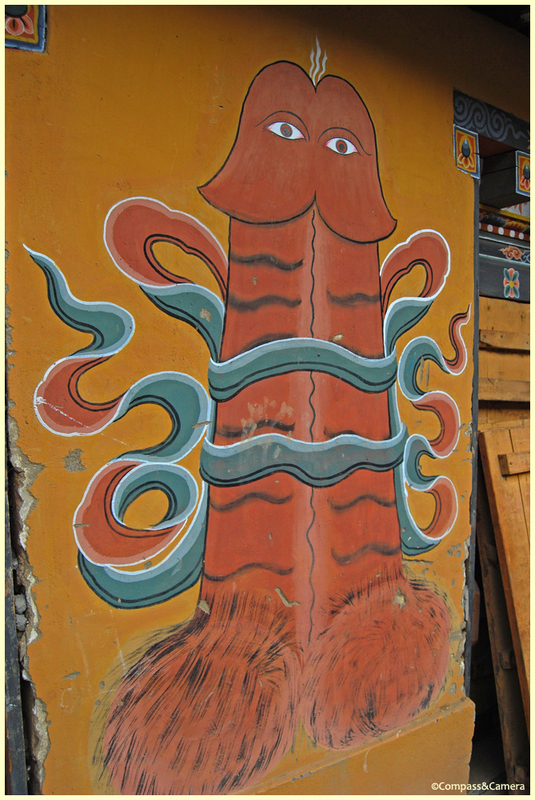 Phalluses are serious business in Bhutan — hanging from the corners of roofs, painted on walls and to the left and right of front doors of many homes. 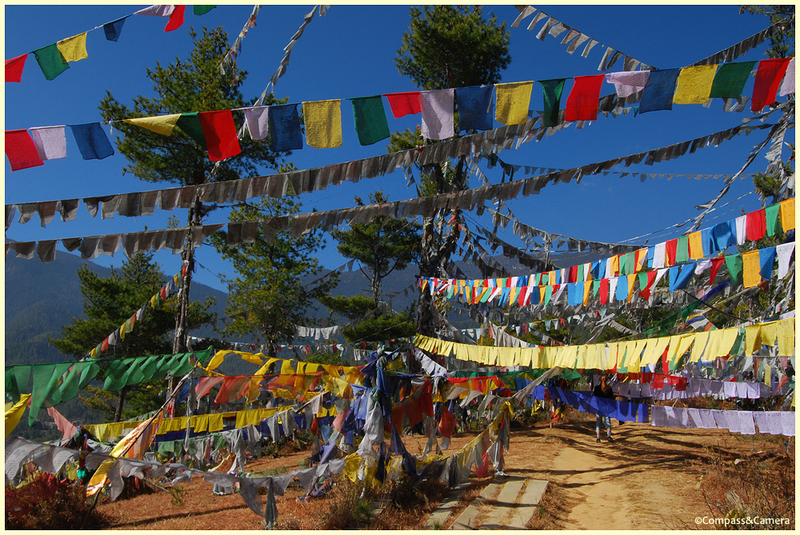 After lunch we set off by foot from Sopsokha to Chimi Lhakhang, or the Temple of the Divine Madman. The sun reached the western sky as we walked a wide road to the east side of the valley. 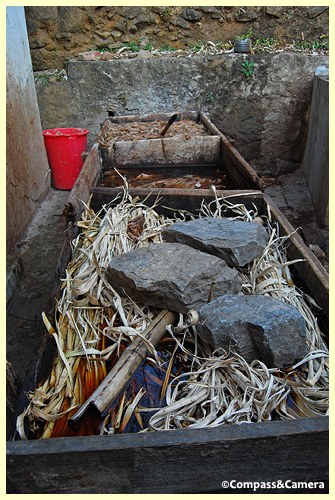 Harvested bundles of rice were carefully stacked in circular mounds like pumpkins with stems on top, each golden bundle waiting to be manually whipped against the ground to release the grain. 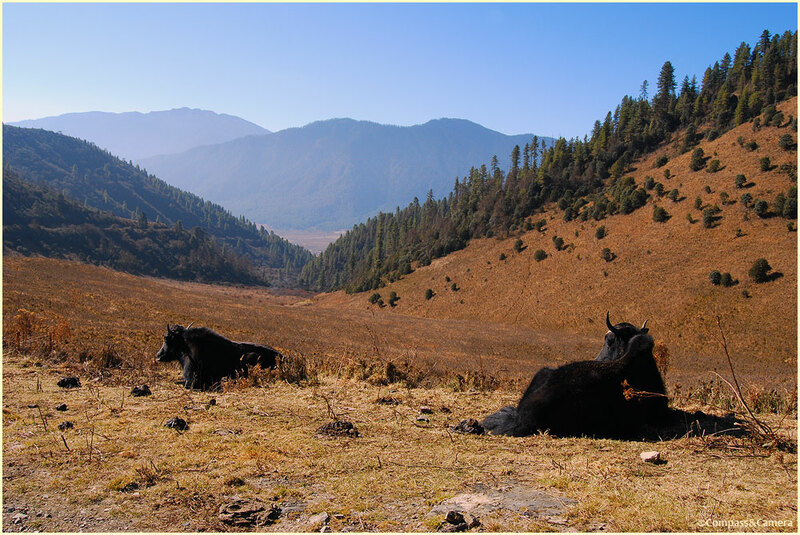 Daily life in Bhutan was yet again on display in a pastoral scene of incredible beauty. Walking uphill, we reached the temple where Kinga gave us a quick tutorial on the history of the Divine Madman. 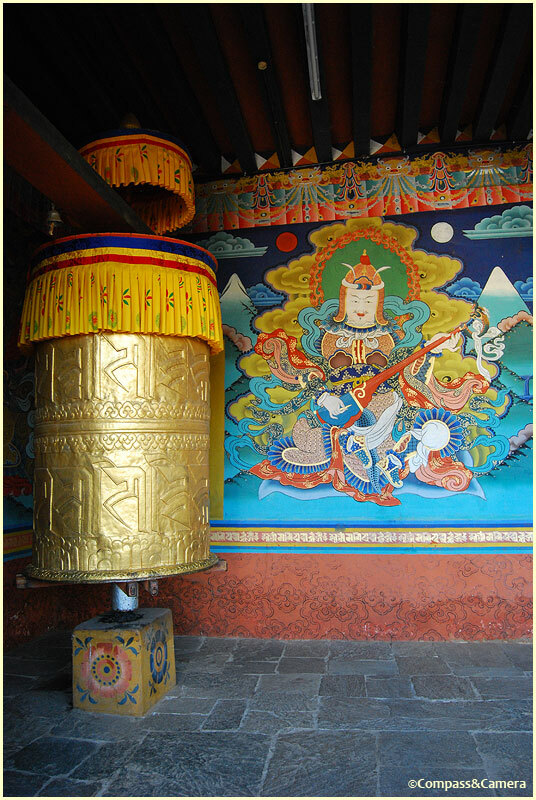 Lama Drukpa Kunley (born 1455) is known in Bhutan as the Divine Madman and creator of the takin (see Day Two’s adventure). 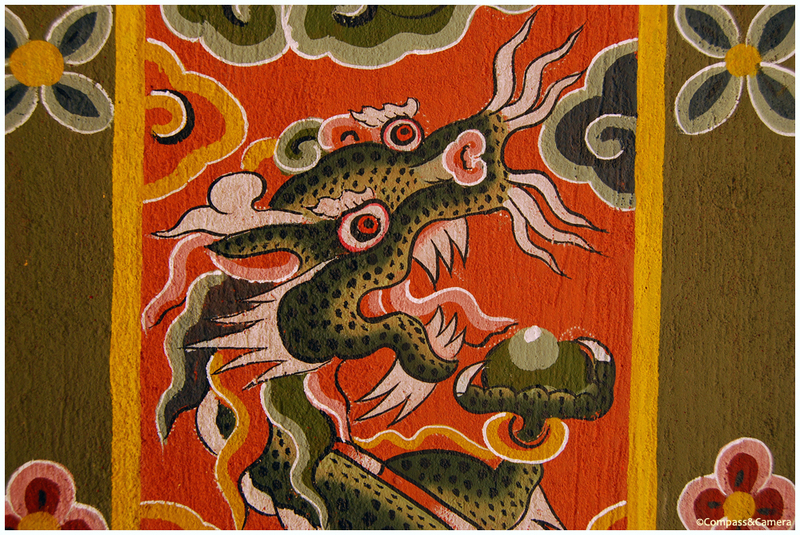 He used his “Thunderbolt of Flaming Wisdom” to turn demonesses into deities, hence Bhutan’s abundance of phallic imagery and statues used to ward off evil spirits. His antics and exploits are legendary, and supposedly he enjoyed the company of hundreds of women thus the Temple of the Divine Madman is known as a temple of fertility. 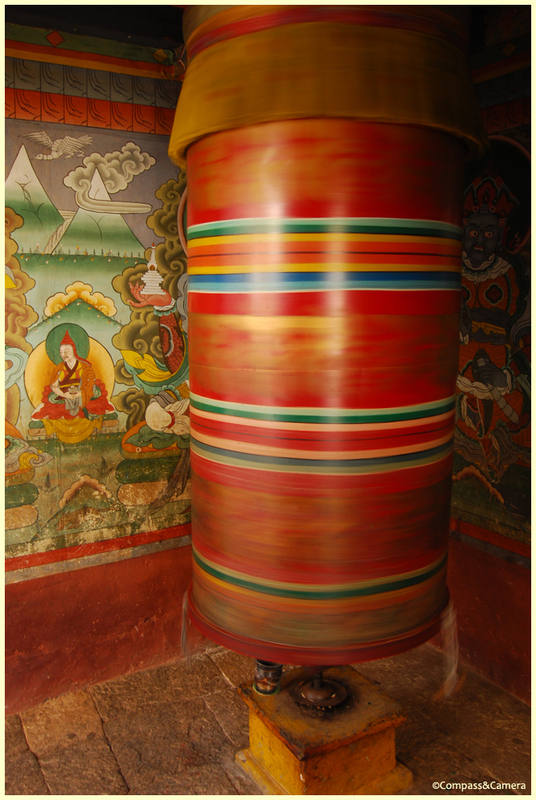 We turned the red prayer wheel at the entrance and toured the small interior where I made an offering of 20 nu. I was blessed by a monk who touched my forehead with 10-inch wooden phallus. Only in Bhutan. 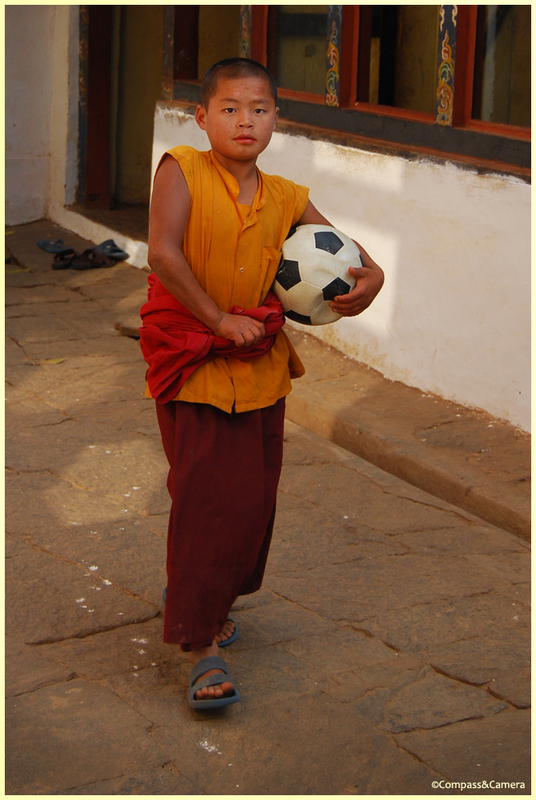 From the interior courtyard, we watched young monks reciting prayers in a small room while another walked past me with a soccer ball under his arm. 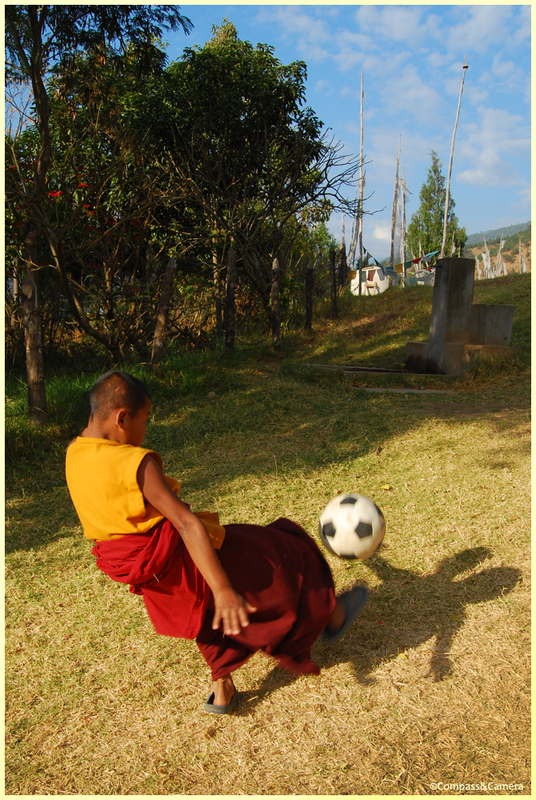 Here it was in Bhutan, the world’s most beloved sport with destiny and fortune at the whim of a black and white leather ball. 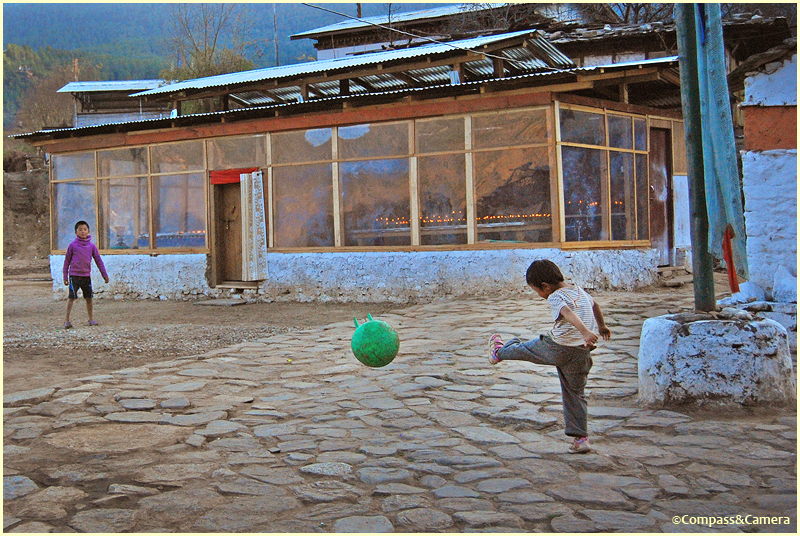 Outside the temple the boy kicked the ball on the hillside. Does he yearn to be the next Messi? Or does he play to pass time, simply for the love of the game? 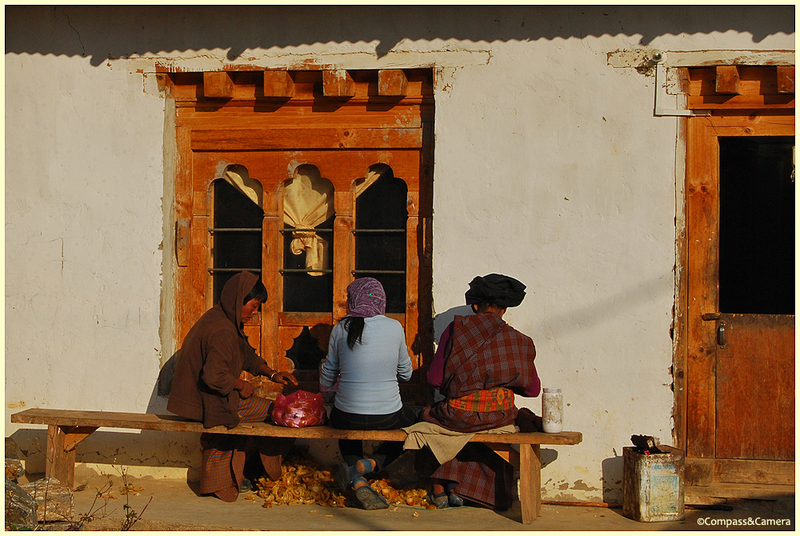 Farther down the trail we passed a trio of women peeling a bag of oranges with their backs turned toward the sun. We walked past hanging laundry, stacks of firewood and doorsteps filled with the sandals of the occupants inside. 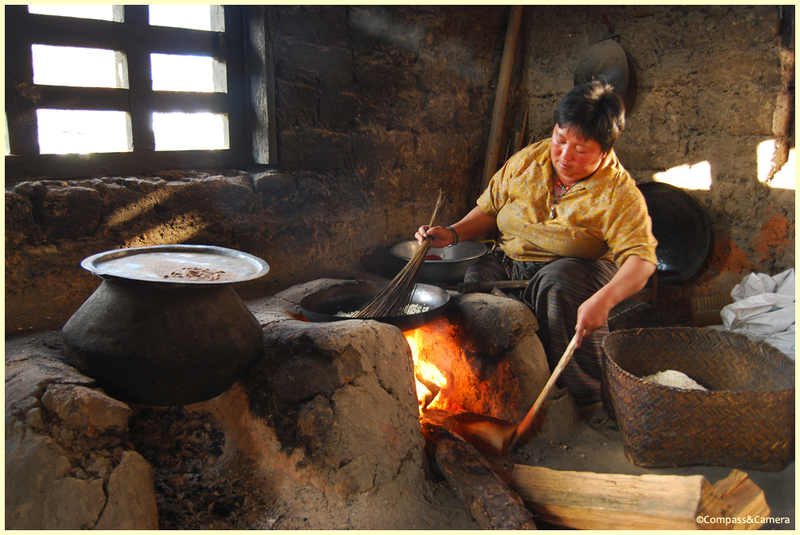 Kinga led us into a small hut where a woman was toasting rice to make candy. 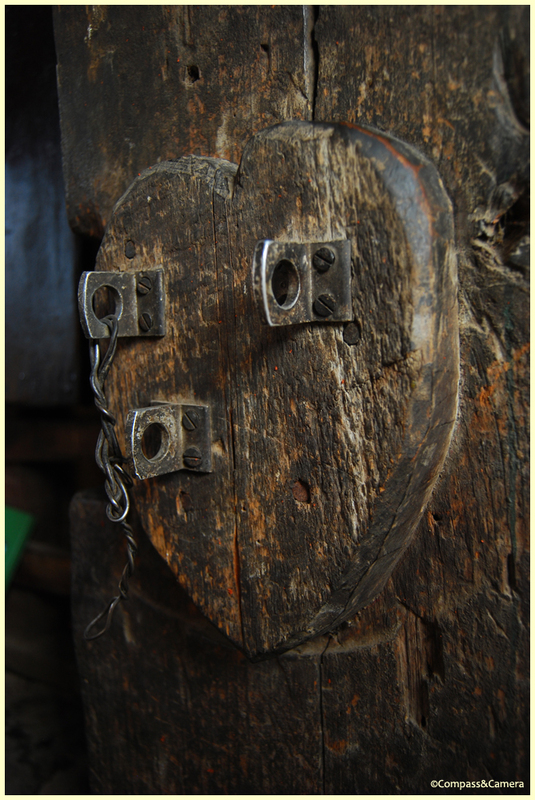 She stoked the fire and stirred the skillet, and laughed when I stopped to photograph the heart-shaped lock on the door. 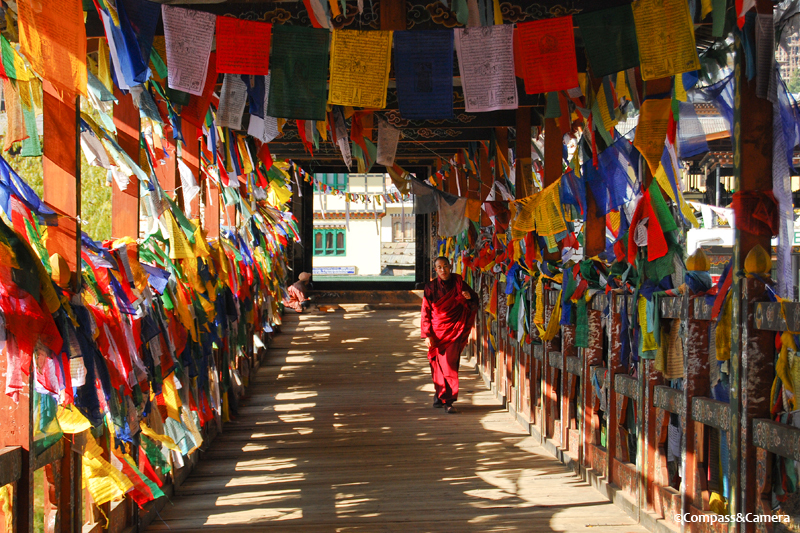 Another two hours in Bhutan, another layer of life in this quiet, peaceful country. 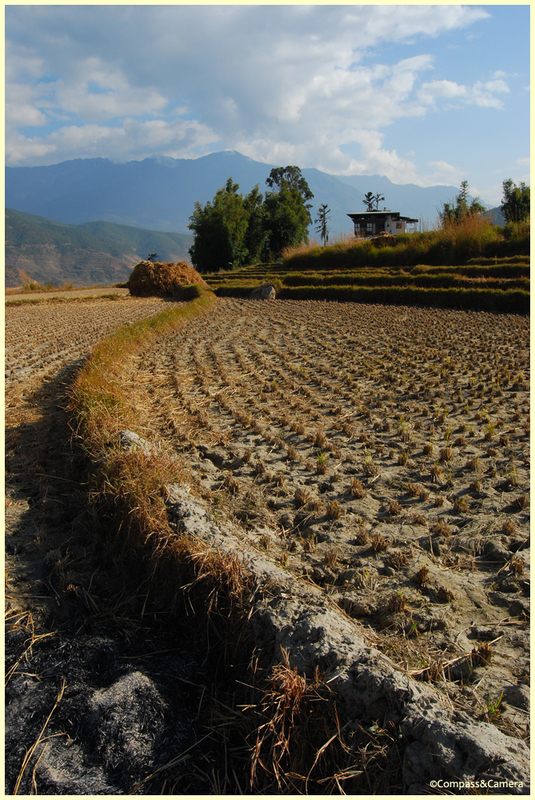 Thirty minutes further by car and we arrived in Punakha — just after the sun had moved behind the mountain ridge to the west, casting shade over the valley. 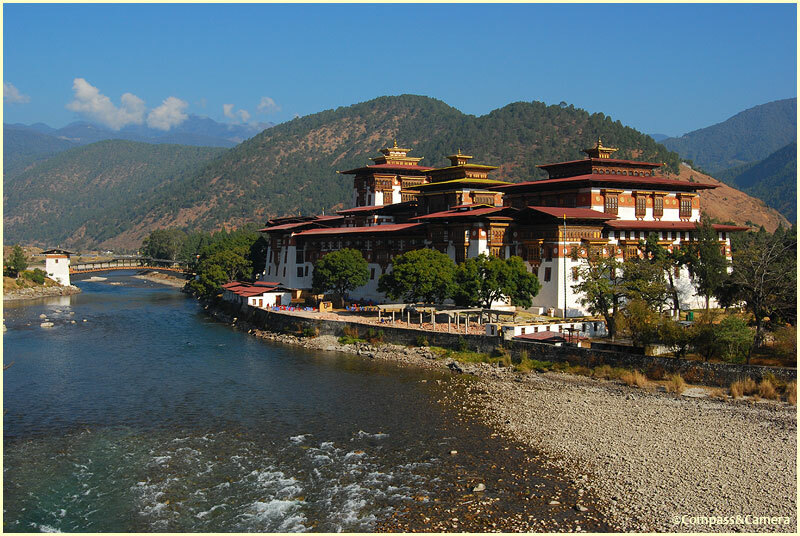 The Punakha Dzong stood proudly at the edge of the river against a backdrop of bluing mountains. Monks dressed in red robes gathered for dinner on the west side as we marveled at the site. 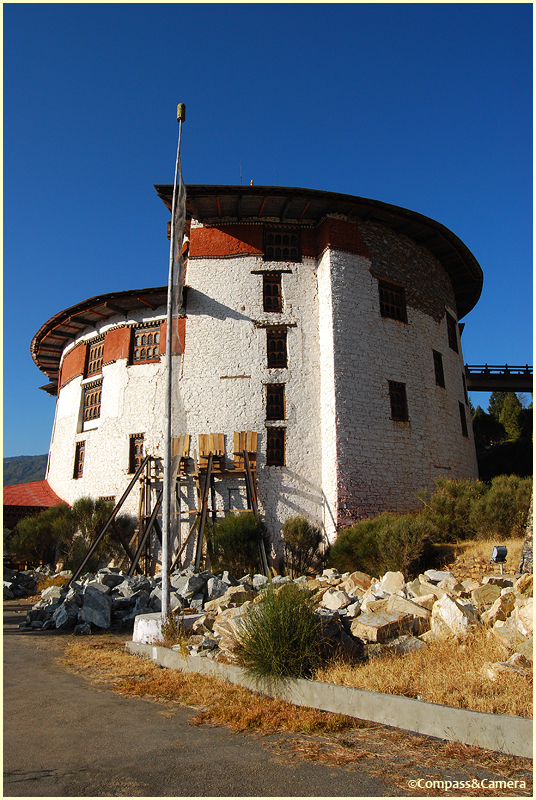 We would return here in two days and tour the dzong on our way back from the Phobjikha valley. Until then… dinner, sleep and the promise of black-necked cranes in the morning.